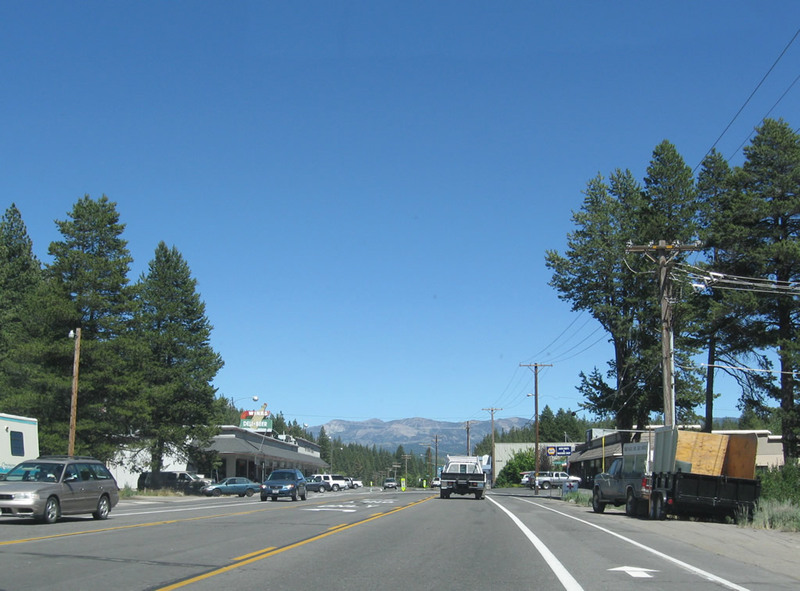 U.S. 40 follows Donner Pass Road in Downtown Truckee. 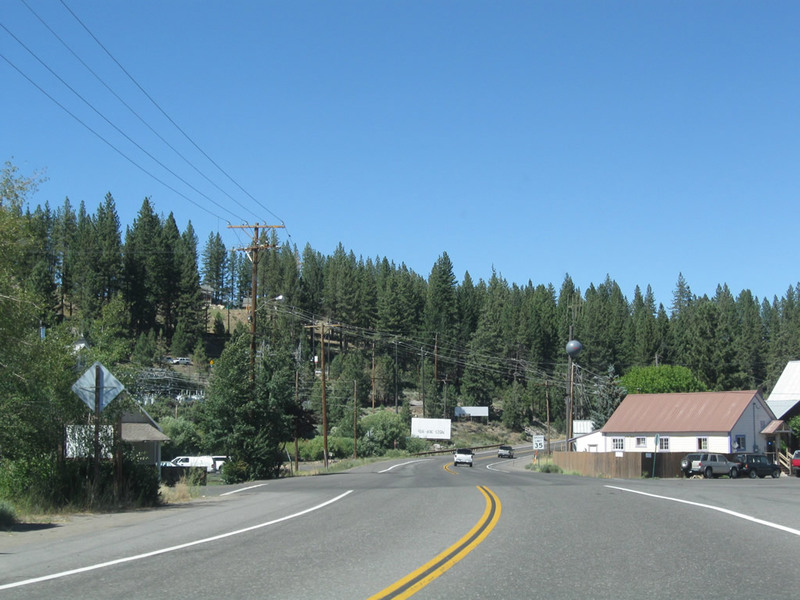 This view looks east along the historic route toward the intersection between Donner Pass Road and Bridge Street (Brockway Road, which was formerly part of California 267 before it was relocated east of downtown). Photo taken 07/21/09. A formerly transcontinental route from San Francisco east to Atlanta City, New Jersey, U.S. 40 no longer travels to California, having been truncated east to I-80 at Silver Creek Junction, Utah. The bulk of old U.S. 40 west from near Park City, Utah was replaced by Interstate 80. 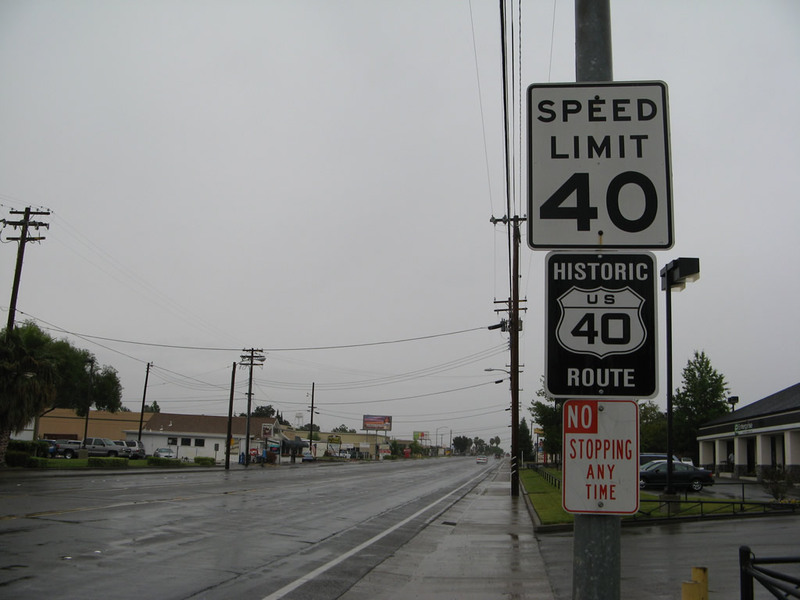 U.S. 40 no longer exists as an official route in California, Nevada, and western Utah. In California, U.S. 40 was mostly replaced by Interstate 80 between downtown San Francisco and the state line near Verdi, Nevada. 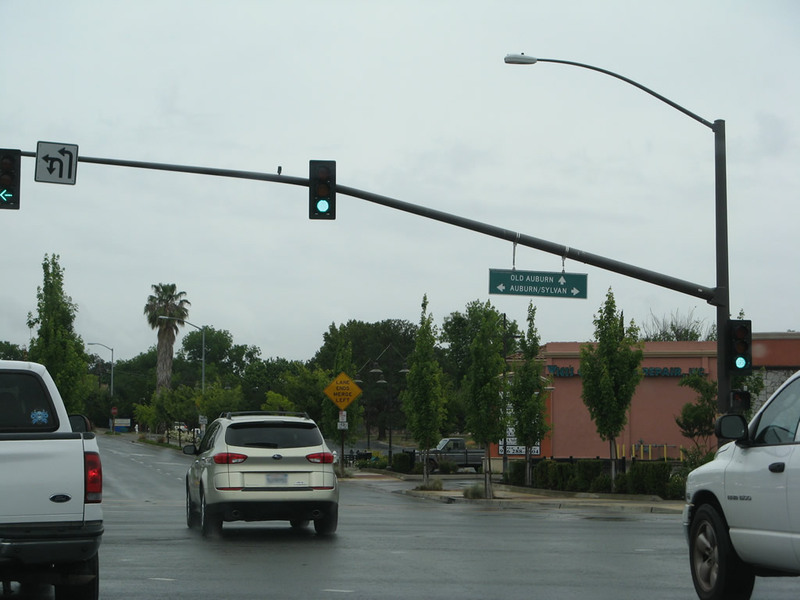 Some old alignments of historic U.S. 40 remain in the state highway system (such as California 123 and Business Loop I-80 in Sacramento). 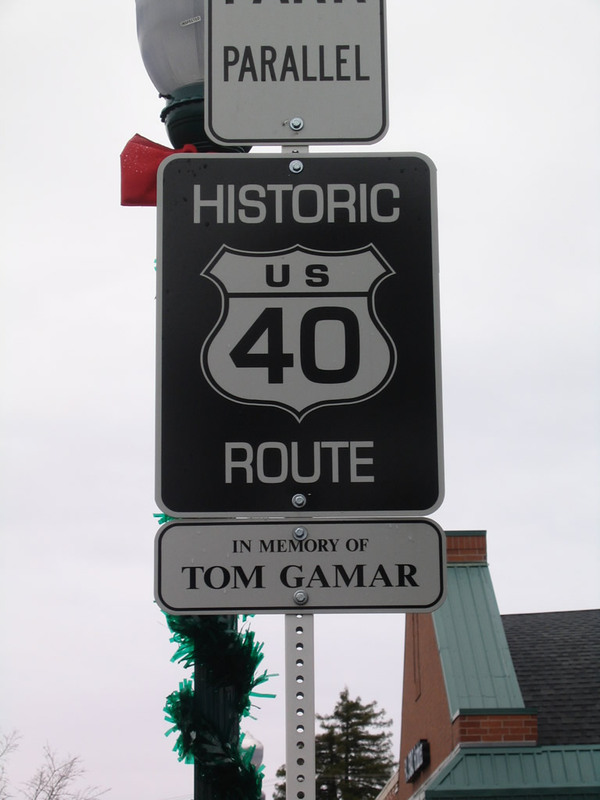 Many sections of the original route (and later realignments) remain intact and in some cases carry Historic U.S. 40 signs. The U.S. highway was truncated from San Francisco to the California-Nevada state line in 1964 (signs were removed starting in 1966). In 1975, the rest of U.S. 40 that overlapped Interstate 80 between Reno and Park City, Utah, was decommissioned. 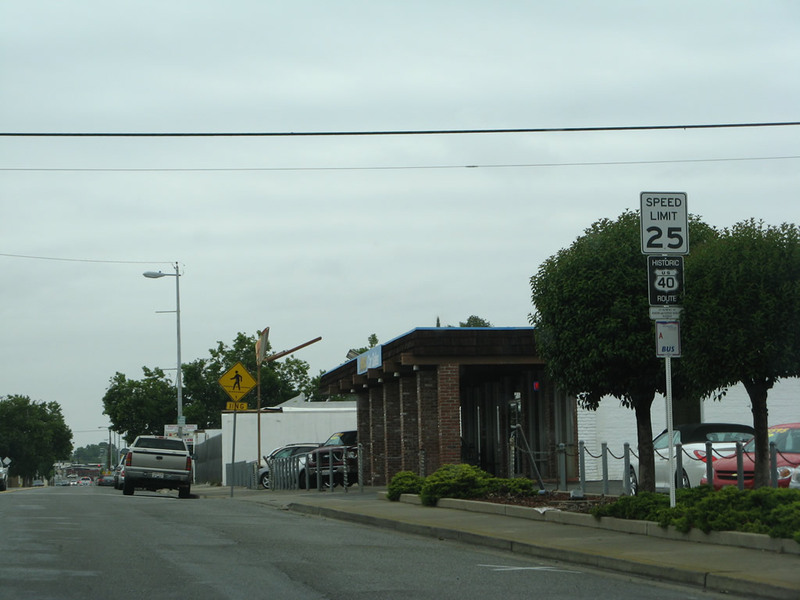 In addition to local street names, portions of U.S. 40 carried two principal highway designations in California: Lincoln Highway and Victory Highway. 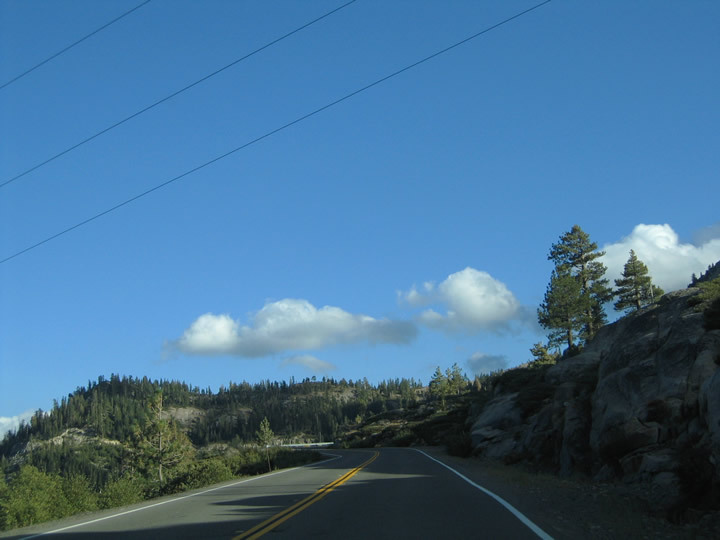 Lincoln Highway: The Lincoln Highway in California (U.S. 40 and U.S. 50) was established in 1913 as the first transcontinental highway in the United States. U.S. 50 carried the Lincoln Highway designation from Oakland to Sacramento (via today&apos;s Interstate 580, Interstate 205, and California 99) and took the southern route over the Sierra Nevada via Echo Pass. 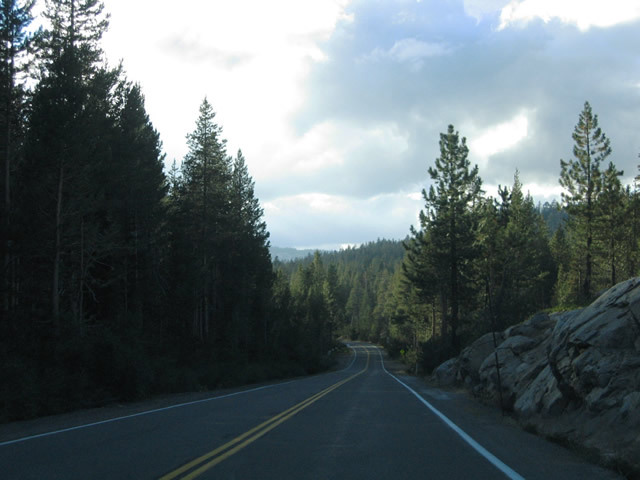 U.S. 40&apos; segment of Lincoln Highway was shorter in the Golden State, including the route from San Francisco to Oakland and also the Lincoln highway&apos;s northern Sierra Nevada branch between Sacramento and Reno via Donner Pass. 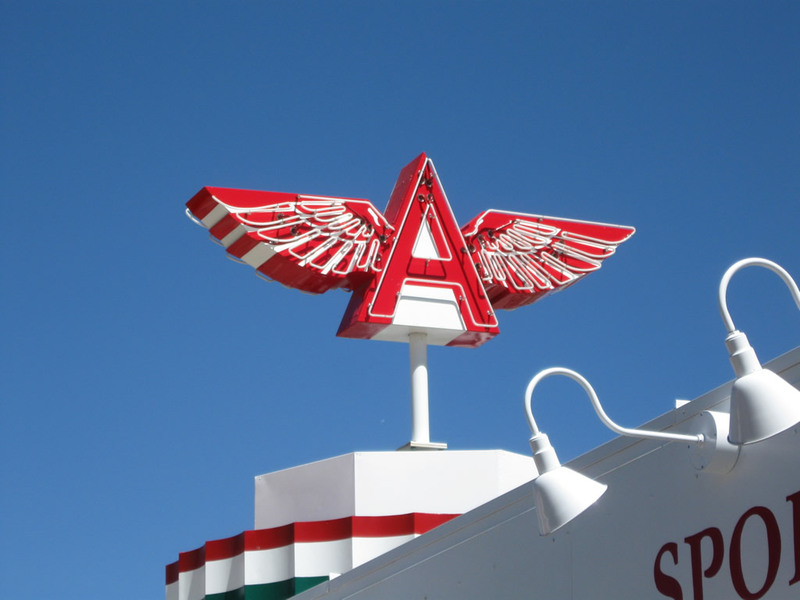 Proceeding east across Nevada, the Lincoln Highway follows U.S. 50 from Fallon to Ely, then takes Alternate U.S. 93 north to Wendover, where it rejoins Interstate 80 and U.S. 40 east to Salt Lake City and Silver Creek Junction. While U.S. 40 turns southeast at Silver Creek Junction toward Denver, today&apos;s Interstate 80 (previously U.S. 189/U.S. 530 and U.S. 30S) carries the Lincoln Highway east to Granger, Wyoming. From there U.S. 30 generally follows the Lincoln Highway from Granger east to Philadelphia, and U.S. 130 and U.S. 1 take the Lincoln Highway northeast to its eastern terminus in New York City. Victory Highway: U.S. 40 also followed the Victory Highway from San Francisco east toward Utah and points east. 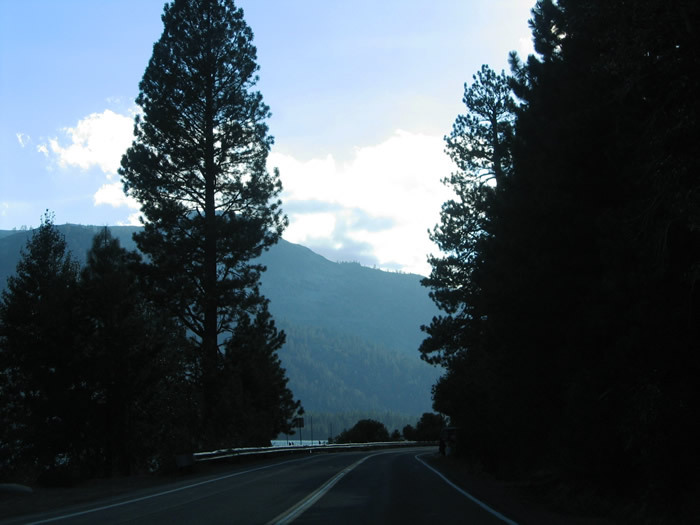 The section of U.S. 40 between Sacramento and Reno was known as the "Big Bend Route" of the Lincoln Highway and is also called the Victory Highway. This auto trail was established in 1921 and was designed to connect San Francisco and New York City via an alternate route instead of the Lincoln Highway. At the California-Nevada state line was an eagle monument that dedicated the Victory Highway "to California-s sons and daughters who served their country in the World War 1917-1918 and to the memory of those who gave the last full measure of devotion." 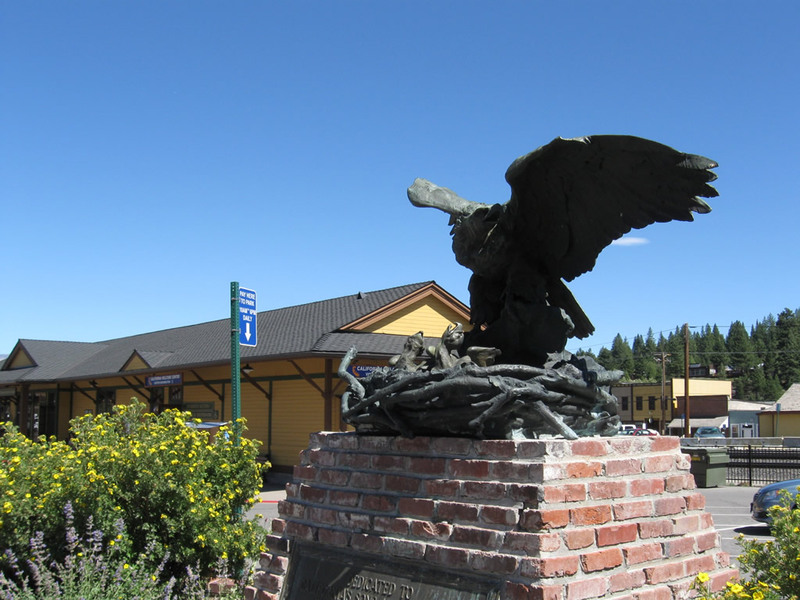 This plaque was relocated in 1960 to downtown Truckee, and it now sits in the parking lot at the train depot that now serves as an official California Welcome Center and tourist information center (see photo below). Most of the route west of St. Louis followed U.S. 40; the Victory Highway (now Interstate 80) was especially notable for the alternative to the U.S. 50 (Lincoln Highway) across northern Nevada. 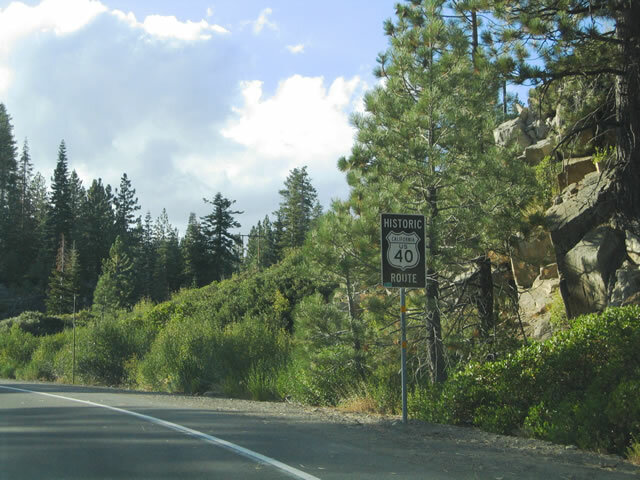 U.S. 40 used to have a long alternate route in Northern California that extended into Reno, Nevada. 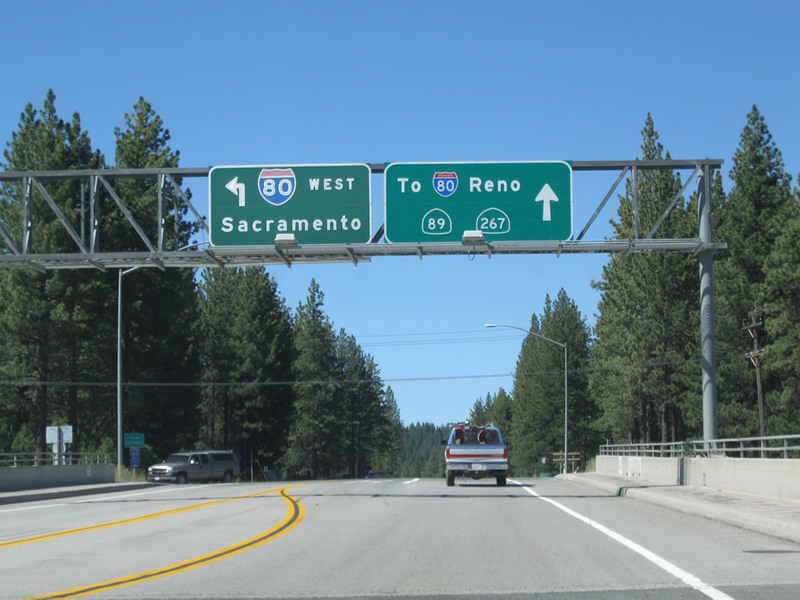 In 1964, U.S. 40 Alternate between Sacramento and Reno was also eliminated. This all-weather route followed current California 113 (former U.S. 99E), California 99, California 20, and California 70 (former California 24) between 1954 and 1964. U.S. 40 Alternate used to pass through Yuba City, Oroville, Quincy, and Portola (via the Feather River Canyon) en route to Hallelujah Junction. 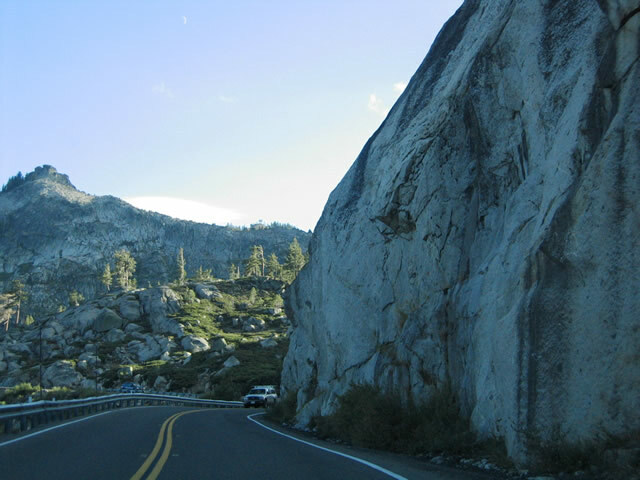 The alternate route provided a lower elevation path through the Sierra Nevada instead of the higher route via the narrow and steep Donner Pass summit, but U.S. 40 Alternate was longer than the main routing of U.S. 40. Good references for U.S. 40 are Historic U.S. 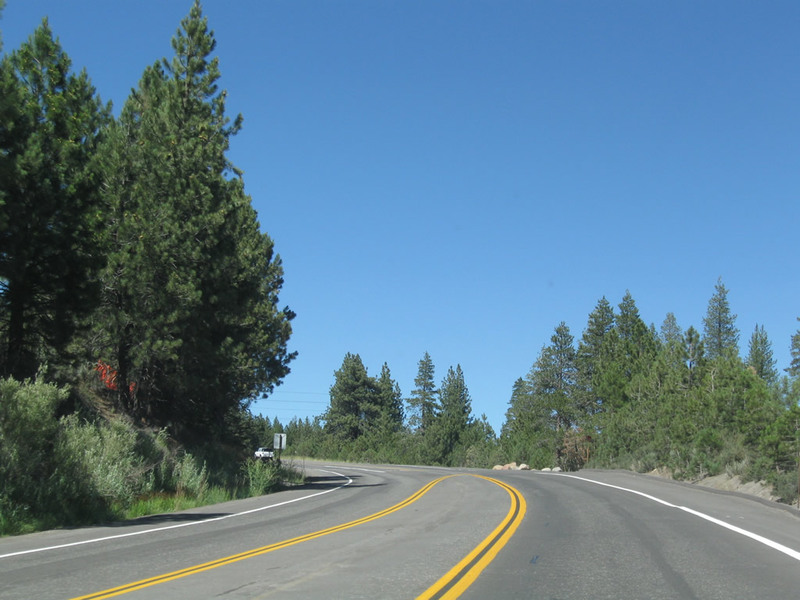 Highways in California: U.S. 40 (Casey Cooper) and Route 40.Net (Frank Brusca). This Historic U.S. 40 route marker is posted along Auburn Boulevard eastbound after the Myrtle Avenue intersection. 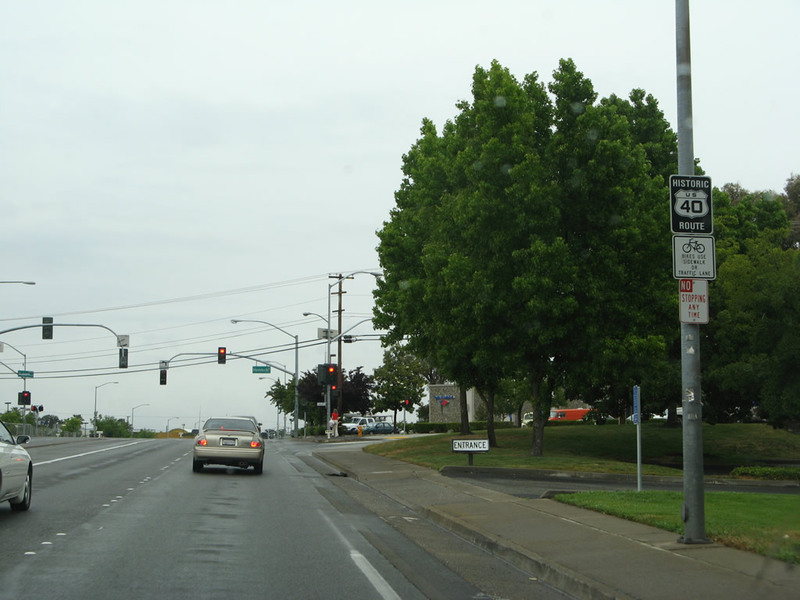 These black and white route markers are posted fairly regularly along Auburn Boulevard between Carmichael and Roseville. U.S. 40 parallels Interstate 80 northeast of Sacramento, but it stays south of the freeway between Exit 95 (80/Business 80 Split) and Exit 102 between Citrus Heights and Roseville. Businesses line much of this stretch of Historic U.S. 40. As of 2008, there were no Historic U.S. 99E route markers posted alongside U.S. 40. Photo taken 05/24/08. 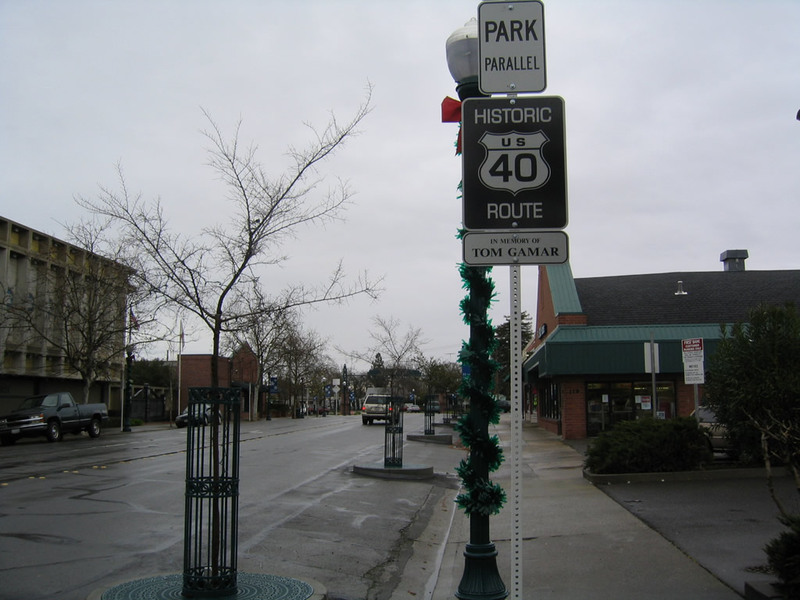 Another Historic U.S. 40 shield is posted between Madison Avenue and Hemlock Street. 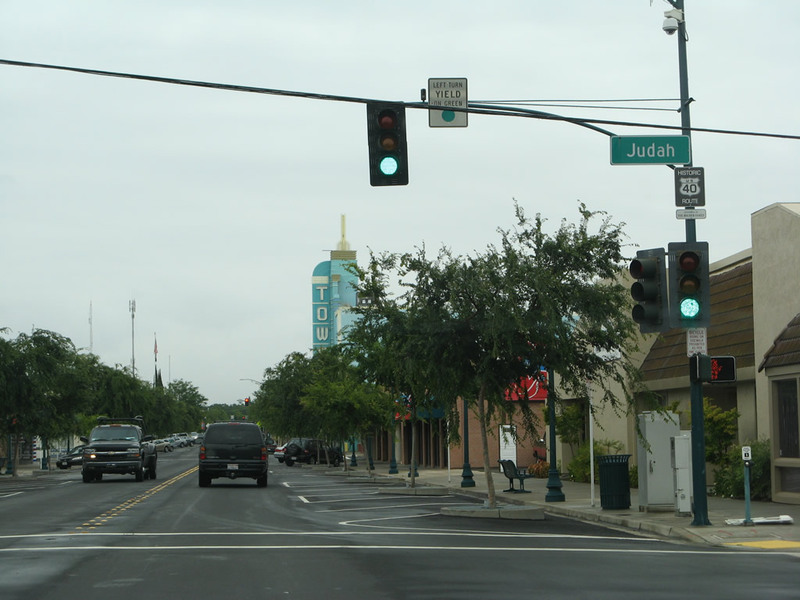 Generally, the historic route is well-signed along Auburn Boulevard through unincorporated Sacramento County, Citrus Heights, and Roseville. Photo taken 05/24/08. 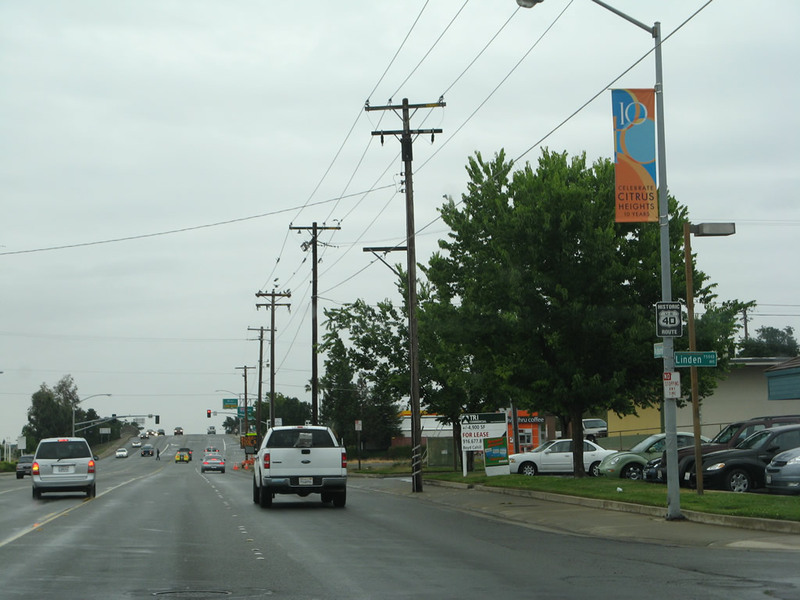 After the Manzanita Avenue intersection, eastbound Historic U.S. 40-99E (Lincoln Highway) enters the city of Citrus Heights, which was incorporated on January 1, 1997, and had a population of 83,301 as of the 2010 Census. Photo taken 05/24/08. 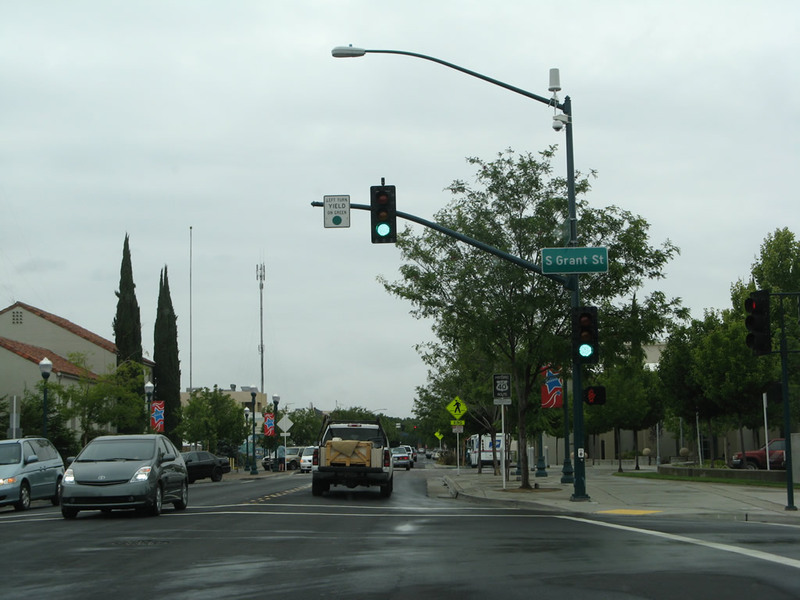 At the intersection with Sylvan Road, eastbound Historic U.S. 40-99E (Auburn Boulevard) in Citrus Heights turns due north toward downtown Roseville. U.S. 40 turns left here, while Old Auburn Road continues straight ahead. Photo taken 05/24/08. Eastbound Historic U.S. 40 (Auburn Boulevard) meets Linden Avenue and approaches the interchange with Interstate 80. Photo taken 05/24/08. 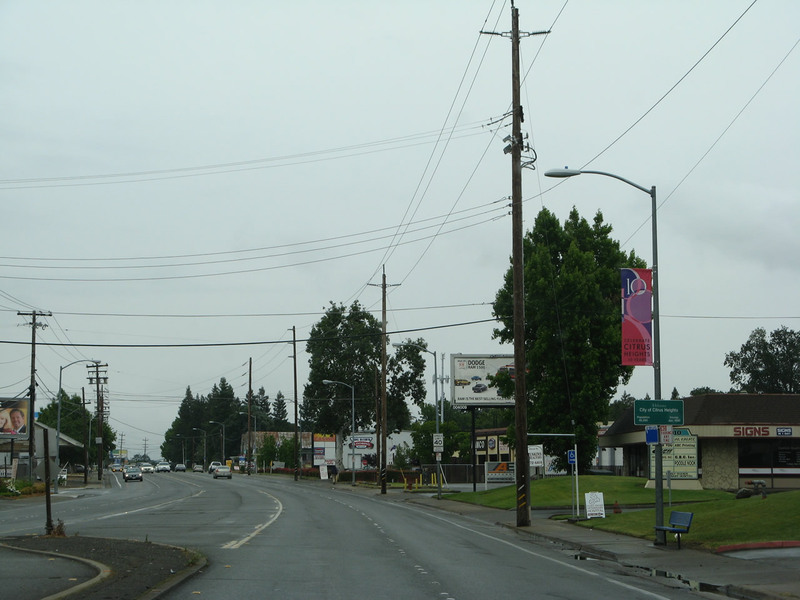 Just before the Interstate 80 interchange, eastbound Historic U.S. 40-99E (Auburn Boulevard) leaves Citrus Heights and enters the city of Roseville, which had a population of 118,788 as of the 2010 Census and was incorporated on April 10, 1909. Photo taken 05/24/08. 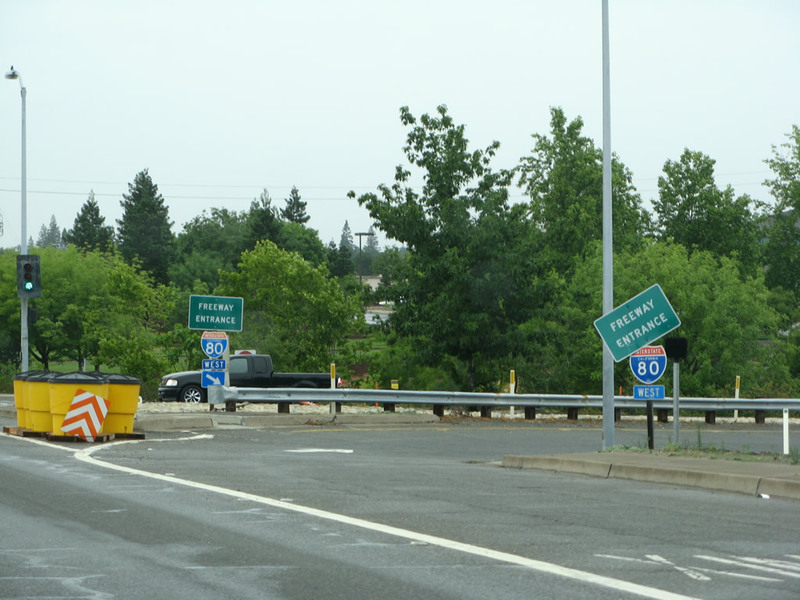 Approaching Interstate 80 at Exit 102 on northbound Auburn Boulevard, stay right for the ramps to Interstate 80. 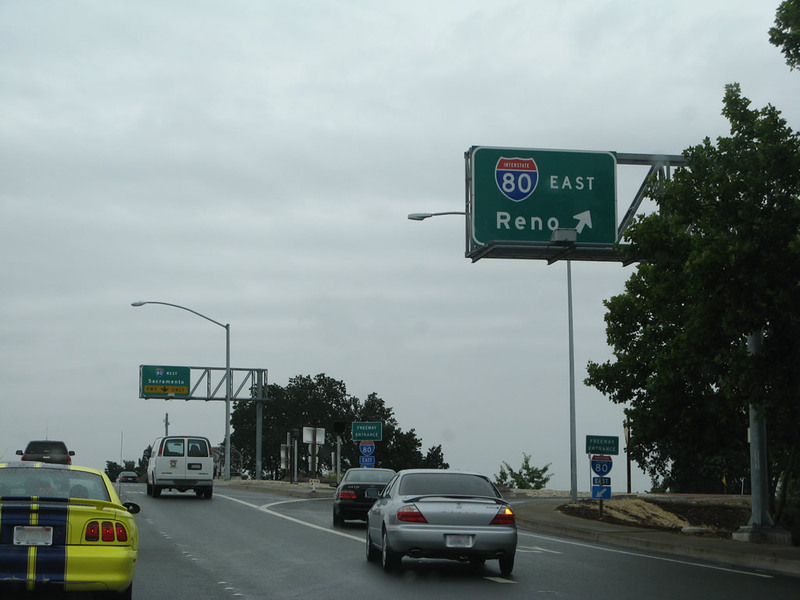 The first right connects to Interstate 80 east to Reno, while the second right connects to Interstate 80 west to Sacramento and San Francisco. Auburn Boulevard changes names into Riverside Avenue. Photos taken 05/24/08. 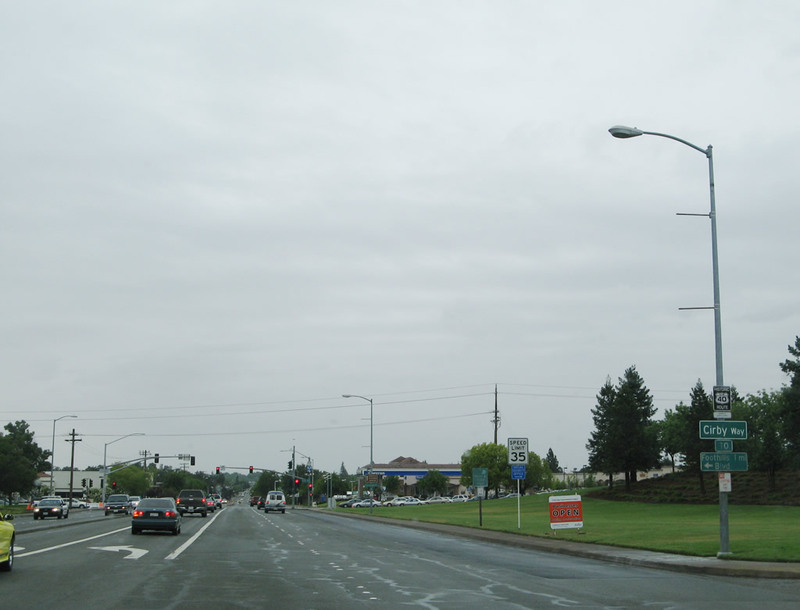 After the Interstate 80 interchange, another Historic U.S. 40 route marker is posted on northbound Riverside Avenue in Roseville, just before Cirby Way. Photo taken 05/24/08. Riverside Avenue carries five lanes (two in each direction plus center turn lane) as we approach the signalized intersection with Darling Way. Photo taken 05/24/08. This Historic U.S. 40 route marker is posted on northbound Riverside Avenueafter the intersection with Darling Way. Photo taken 05/24/08. Approaching Cherry Street, Historic U.S. 40-99E (Riverside Avenue) narrows to just two lanes. Photo taken 05/24/08. Eastbound Historic U.S. 40-99E (Riverside Avenue) approaches Vernon Street and Douglas Boulevard. Old U.S. 40 transitions onto Vernon Street. Turn right for Douglas Boulevard east back to Interstate 80 at Exit 103. Photo taken 05/24/08. 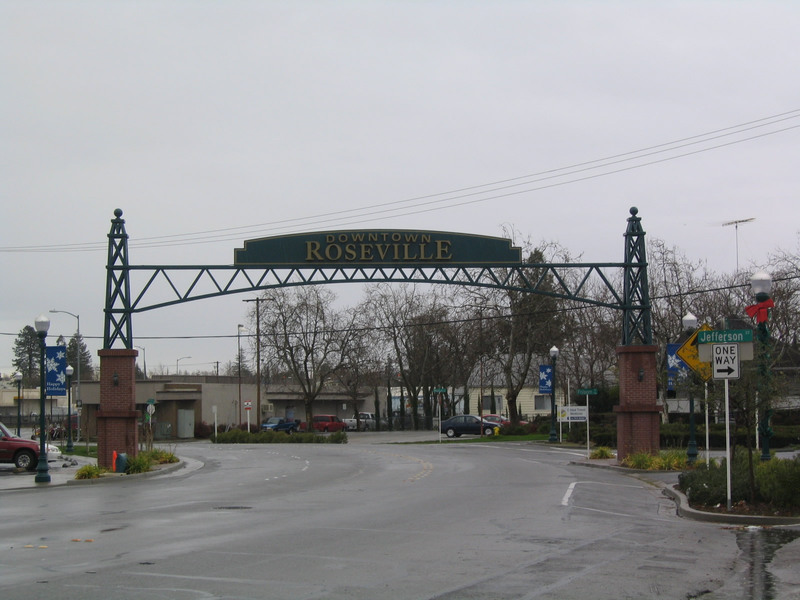 Eastbound Historic U.S. 40-99E (Vernon Street) enters historic downtown Roseville. The business district is marked by this large arch sign welcoming visitors into the city center. Photo taken 05/24/08. Continuing through the central business district, Historic U.S. 40-99E (Vernon Street) meets Judah Street. Photo taken 05/24/08. 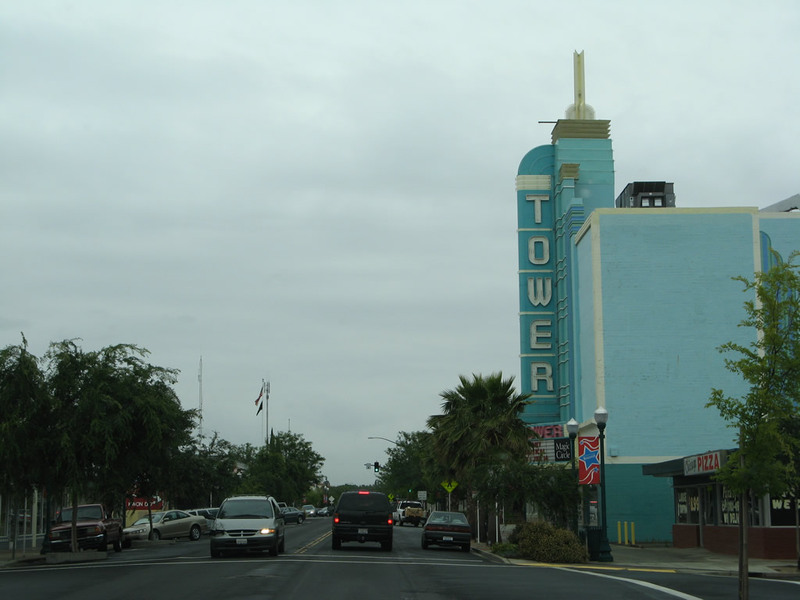 Approaching the Tower Theater in Downtown Roseville, another dominant feature along Vernon Street. Photo taken 05/24/08. At the Grant Street intersection, the historic routes divide. 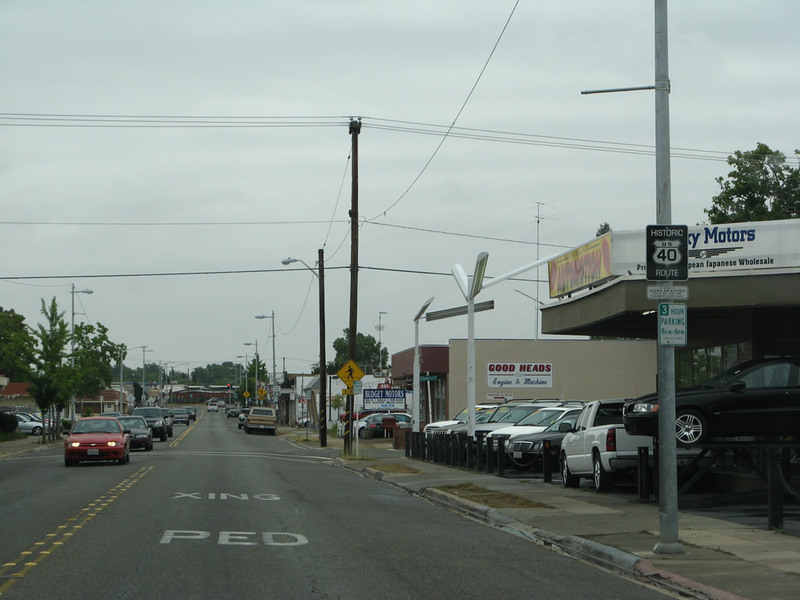 To continue east on U.S. 40, follow Vernon Street northeast straight ahead through this intersection. To follow U.S. 99E north to Lincoln, turn right on Grant Street, then left on Oak Street, and another left on Washington Boulevard. U.S. 99E took Washington Boulevard via a subway to pass under Vernon Street and the railroad tracks. Photo taken 05/24/08. A Historic U.S. 40 shield stands along Vernon Street eastbound beyond the split with Historic U.S. 99E. This sign is very comparable to the ones found on Auburn Boulevard southwest of here. Photos taken 12/28/04. 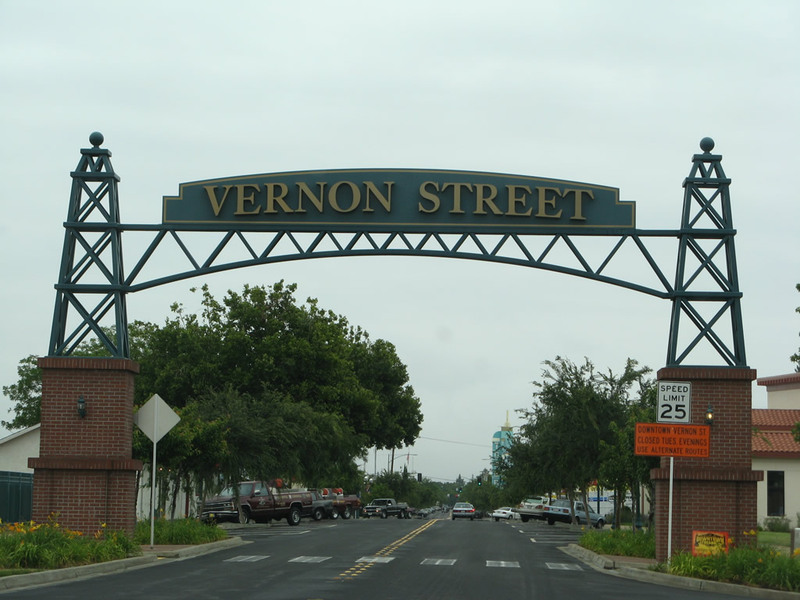 Another arch passes over eastbound Vernon Street near Jefferson Street, this time saying "Downtown Roseville." Photo taken 12/28/04. 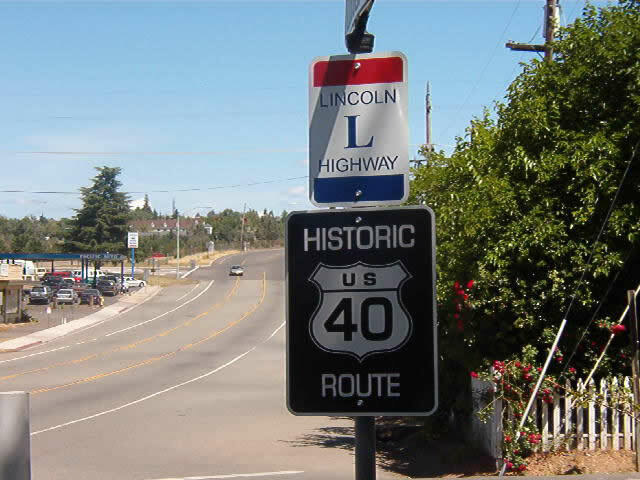 Skipping ahead out of Roseville and into the Sierra Nevada foothills, this Historic U.S. 40 shield and Lincoln Highway marker are found along Lincoln Way eastbound at Russell Road in Auburn. Photo taken by James Horton, 05/10/04. Much further east and on the other side of Donner Pass in the Sierra Nevada, Historic U.S. 40 (Donner Pass Road) enters the town of Truckee. 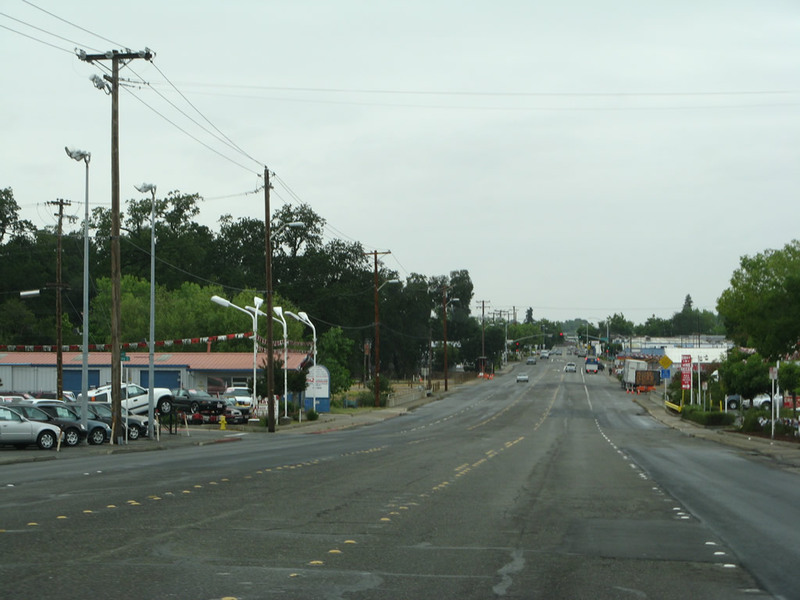 The town had a population of 13,864 as of the 2000 Census, consists of 33.8 square miles, has an elevation of 5,817 feet, and was incorporated on March 23, 1993. 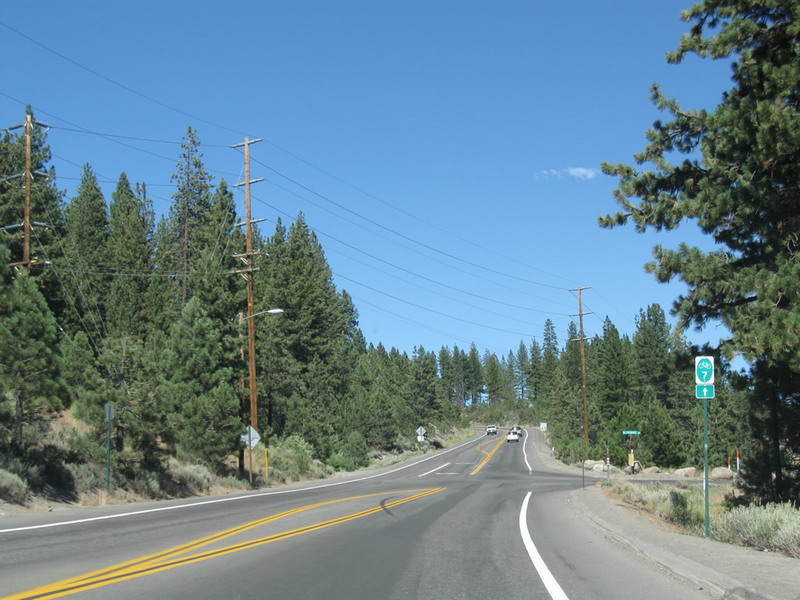 This view looks east after the intersection with California 89 in Truckee. While California 89 used to follow U.S. 40 through the town, it now shares alignment with Interstate 80 to bypass downtown. Photo taken 07/21/09. Eastbound Historic U.S. 40 turns to the southeast and approaches an interchange with Interstate 80 (Exit 186). Prior to 1993, the former route of U.S. 40 was designated as Business Loop I-80 (between Exits 184 and 188). 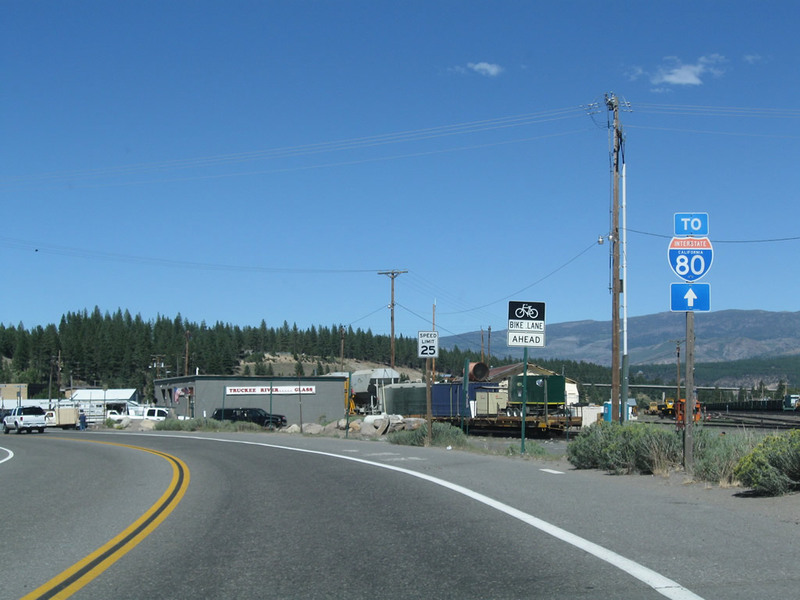 No evidence of the business loop remains in Truckee, and a signage project couple with roadway expansion and pavement replacement project in the early 2000s resulted in the last "Route 80 Business" sign along westbound Interstate 80 to be removed. Photo taken 07/21/09. 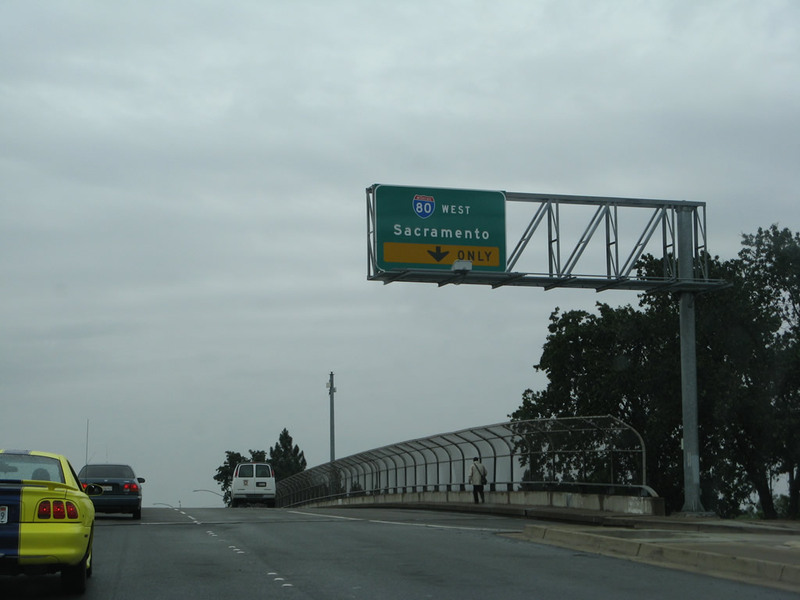 The only on-ramp connects old U.S. 40 with westbound Interstate 80 to Sacramento and San Francisco. Photo taken 07/21/09. 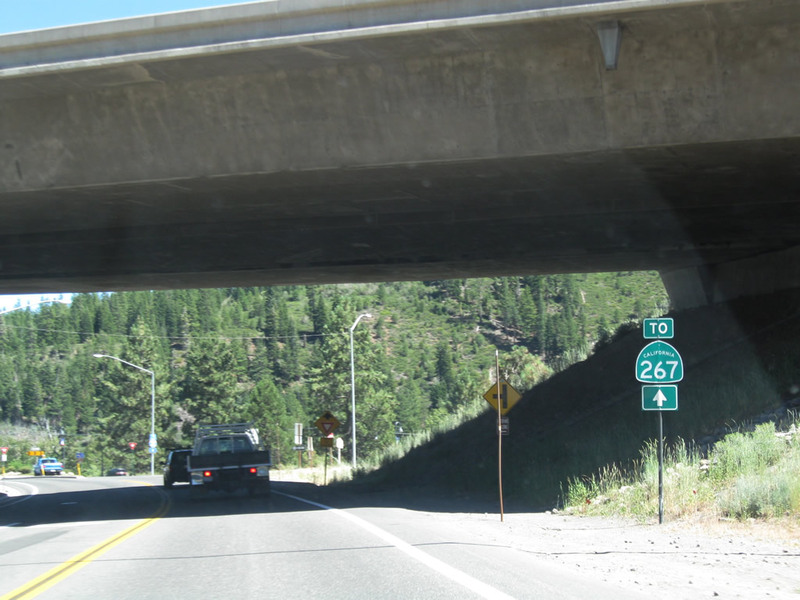 A California 267 trailblazer is posted along eastbound old U.S. 40 as the historic route passes under the Interstate 80 bridge. Photo taken 07/21/09. 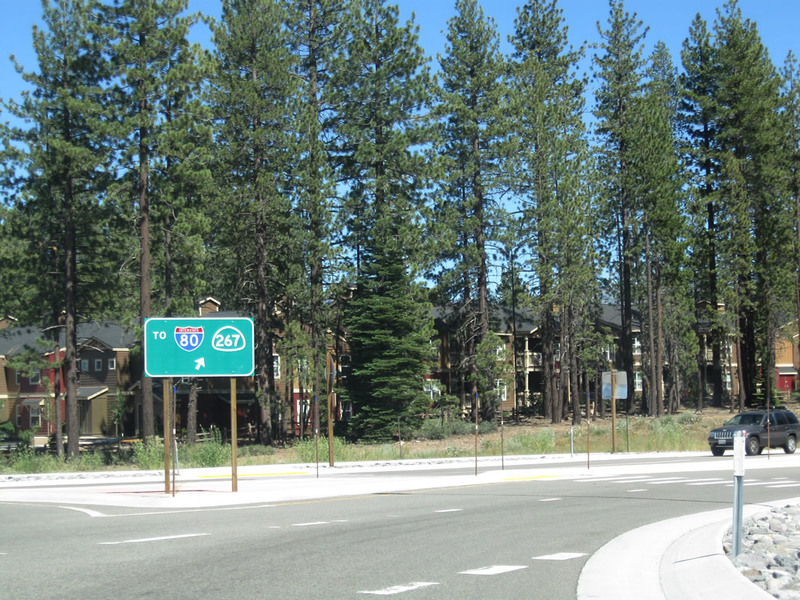 Historic U.S. 40 (Donner Pass Road) approaches a traffic circle roundabout with McIver Crossing. 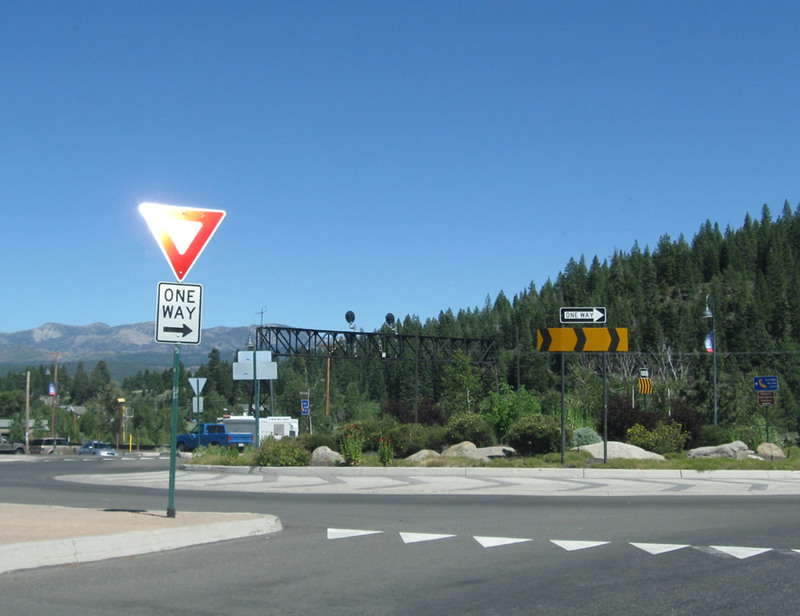 Turn right (southwest) on McIver Crossing to pass under the railroad to West River Street; stay left to continue east on U.S. 40 toward downtown Truckee. West River Street is likely to be an old alignment of California 89, as it leads southwest to meet California 89 south of town. Photo taken 07/21/09. The landscaped traffic circle roundabout with McIver Crossing (to West River Street) was constructed in 1998. 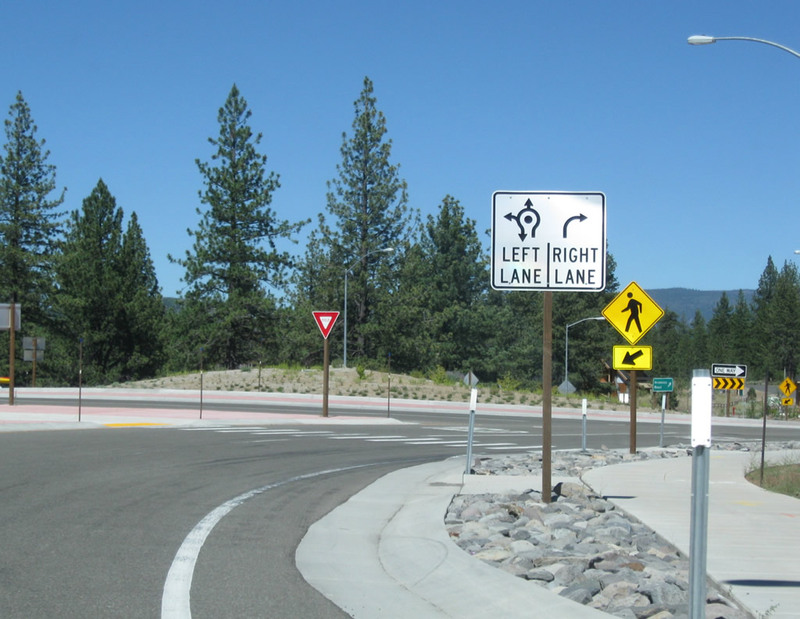 Due to the success of moving traffic without traffic signals or stop signs, other roundabouts have been constructed in Truckee. 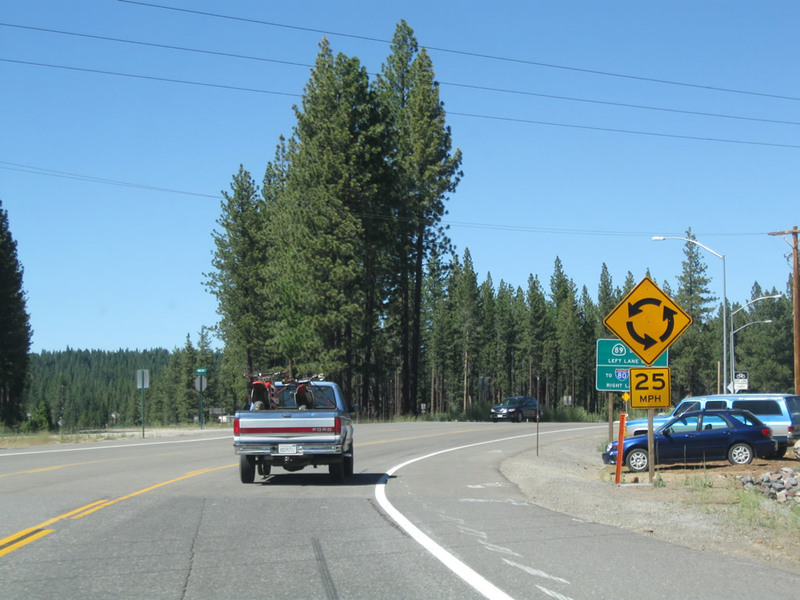 This includes the two roundabouts at the interchange between Interstate 80 and California 89 south (dedicated on December 21, 2005) and a newer roundabout at the east of downtown Truckee between Historic U.S. 40 (Donner Pass Road), California 89, and California 267.1 Photo taken 07/21/09. 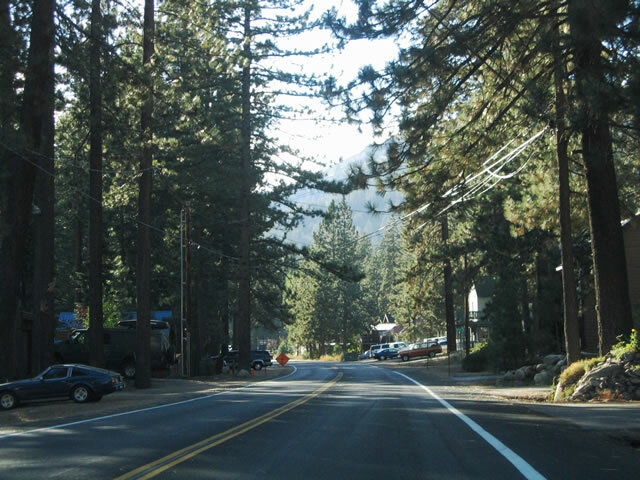 Follow Historic U.S. 40 (Donner Pass Road) east to downtown Truckee and the official California Welcome Center. A trailblazer Historic U.S. 40 shield would be a nice addition to this sign assembly. 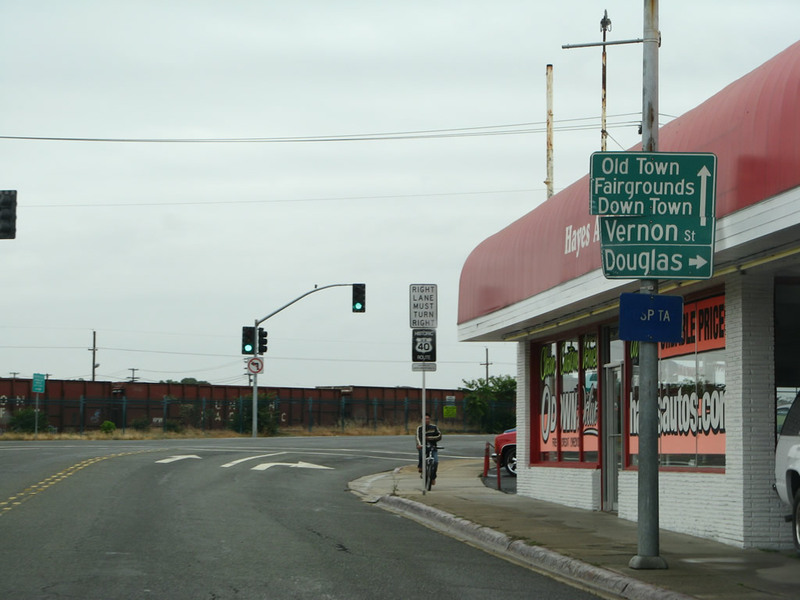 Behind the sign is the Union Pacific Railroad, which travels east-west through the Sierra Nevada and is part of a primary rail corridor bringing goods from the east into California. Photo taken 07/21/09. 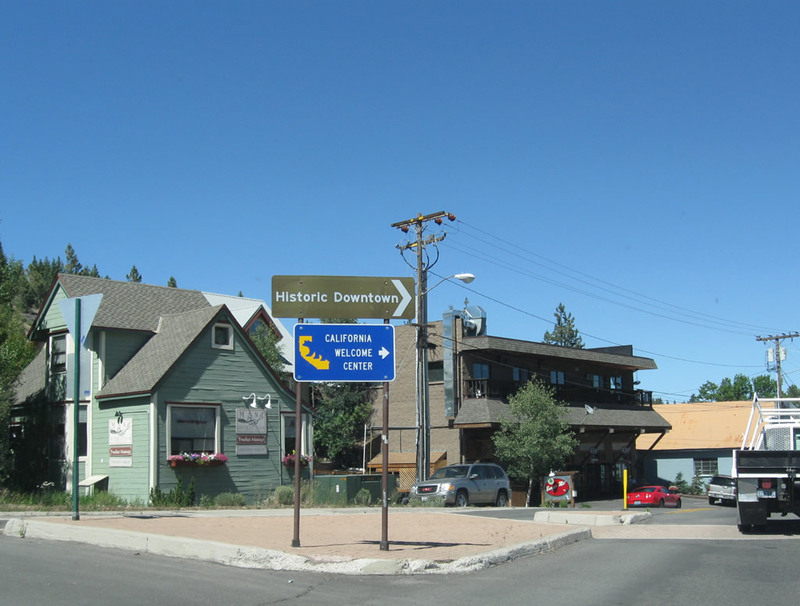 A second trailblazer sign for downtown Truckee and the California Welcome Center as Historic U.S. 40 east leaves the roundabout into downtown. Photo taken 07/21/09. 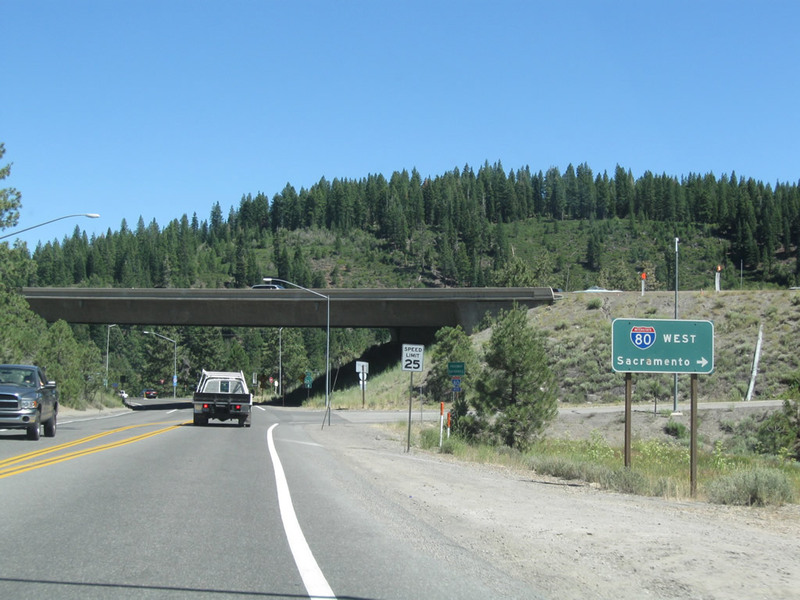 Eastbound Historic U.S. 40 (Donner Pass Road), also formerly Business Loop I-80 and California 89, enters downtown Truckee. A variety of stores and restaurants line the old alignment. Photo taken 07/21/09. 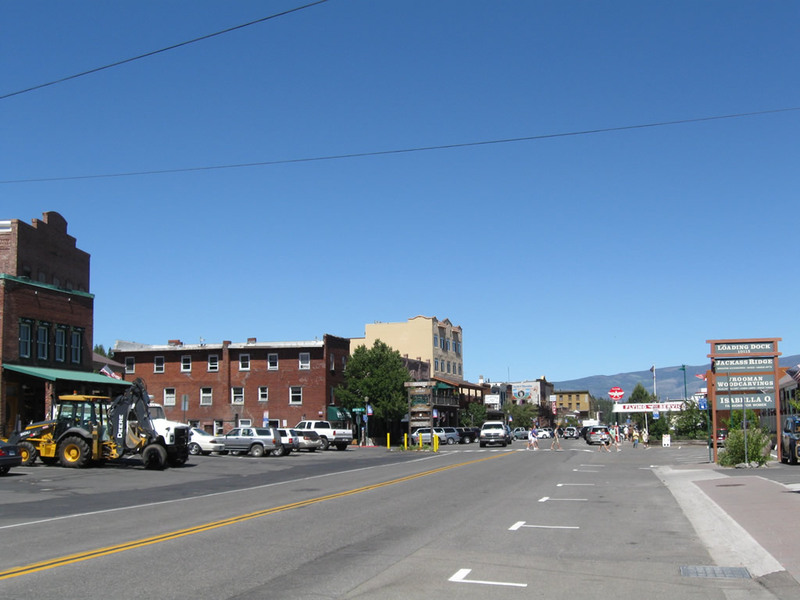 The Union Pacific Railroad parallels U.S. 40 through downtown Truckee. Photo taken 07/21/09. 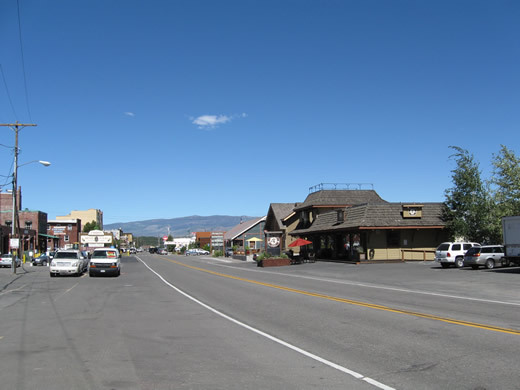 Eastbound Historic U.S. 40 (Donner Pass Road) passes through downtown Truckee. Most shops and restaurants are on the north side of the street, while the railroad tracks are next to the south side of the road. Photo taken 07/21/09. 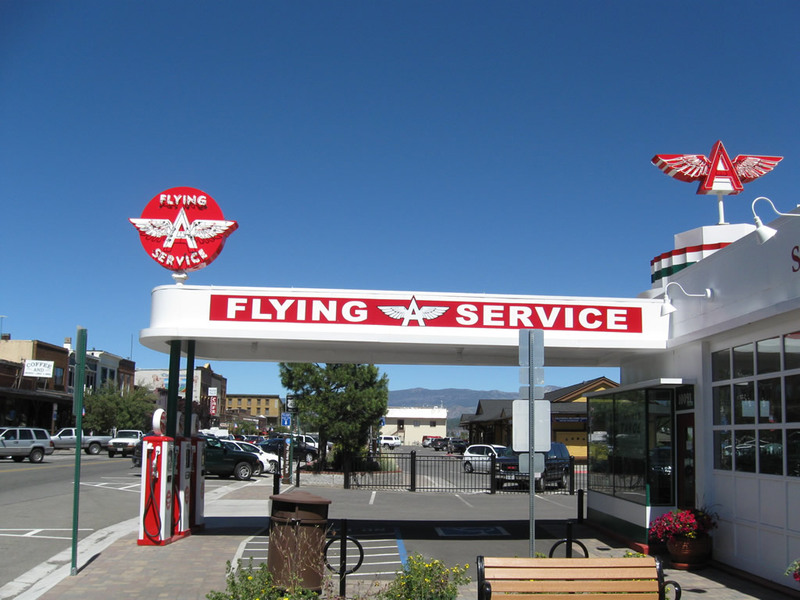 A restored Flying A service station is on the south side of Historic U.S. 40 (Donner Pass Road) in downtown Truckee. 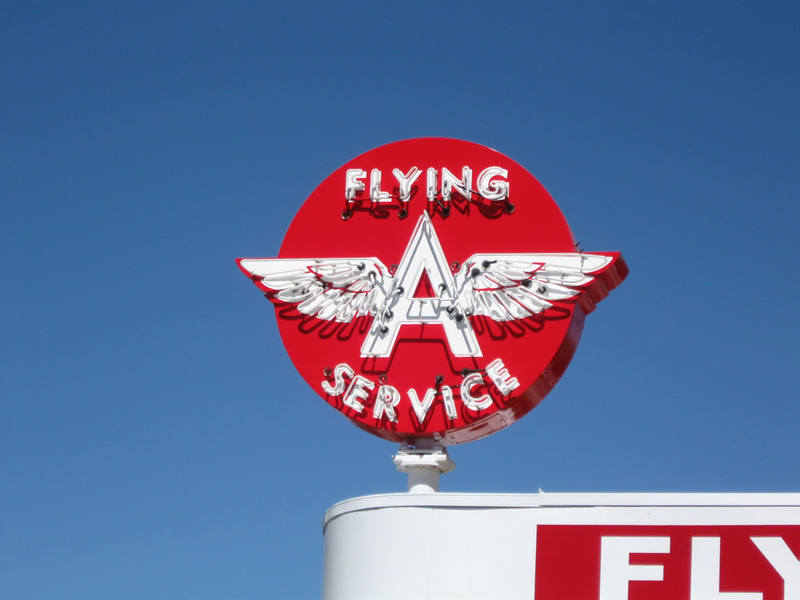 While the service station no longer offers gasoline or motor vehicle services, the marquee and entrance are reminiscent of another era. Photos taken 07/21/09. 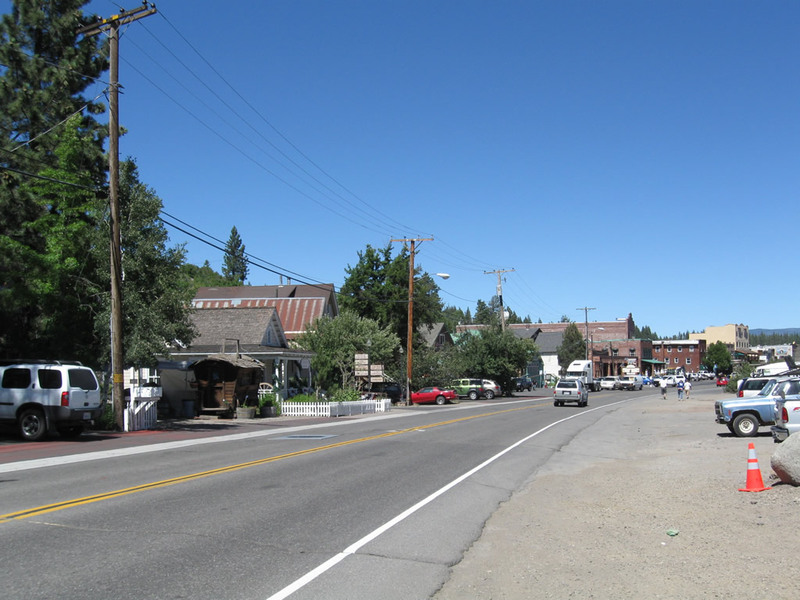 Looking north from Historic U.S. 40 (Donner Pass Road) near the Flying A service station is this view of some historic buildings that line downtown Truckee. 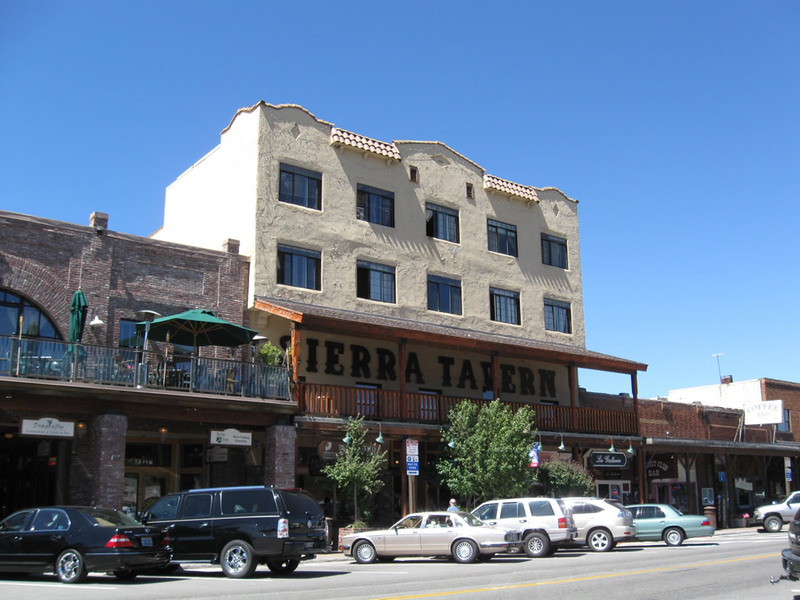 Foremost here is the Sierra Tavern. Photo taken 07/21/09. 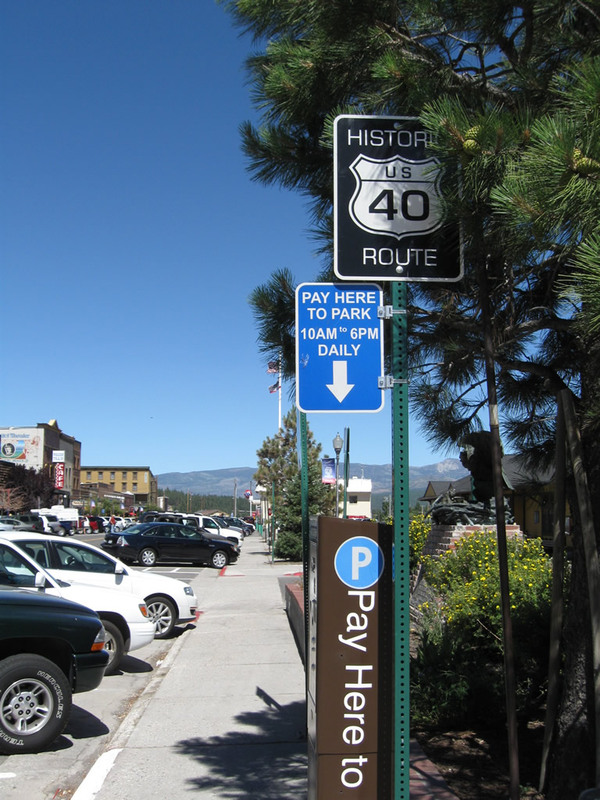 A U.S. 40 reassurance shield is posted along eastbound Donner Pass Road in downtown Truckee. 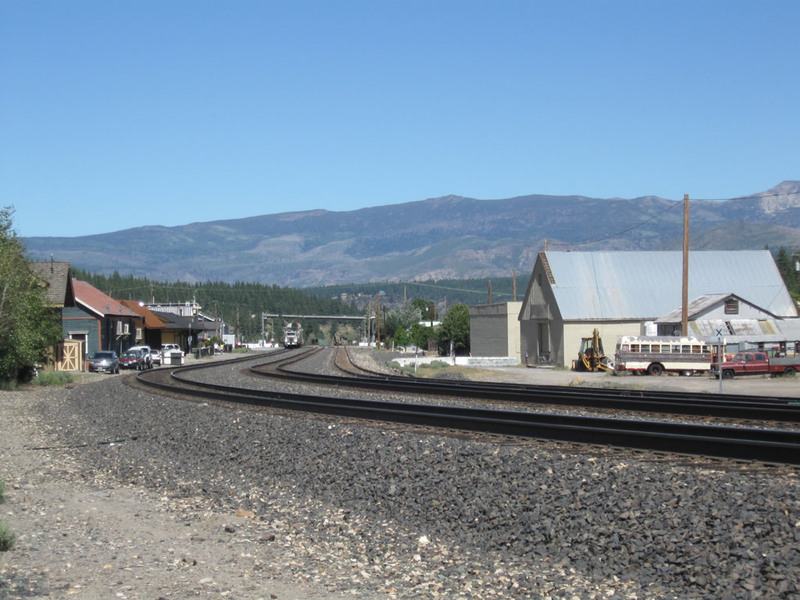 Ahead on the right is the railroad depot, which now serves as the California Welcome Center and Truckee visitor information center. Photo taken 07/21/09. At the California-Nevada state line was this eagle monument that dedicated the Victory Highway "to California-s sons and daughters who served their country in the World War 1917-1918 and to the memory of those who gave the last full measure of devotion." 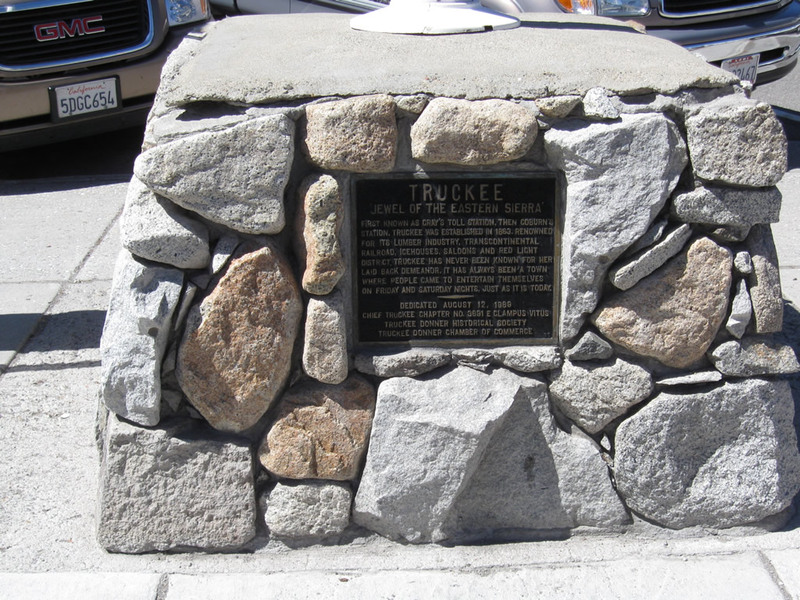 This plaque was relocated in 1960 to downtown Truckee, and it now sits here, in the parking lot at the train depot that now serves as an official California Welcome Center and tourist information center. Photo taken 07/21/09. 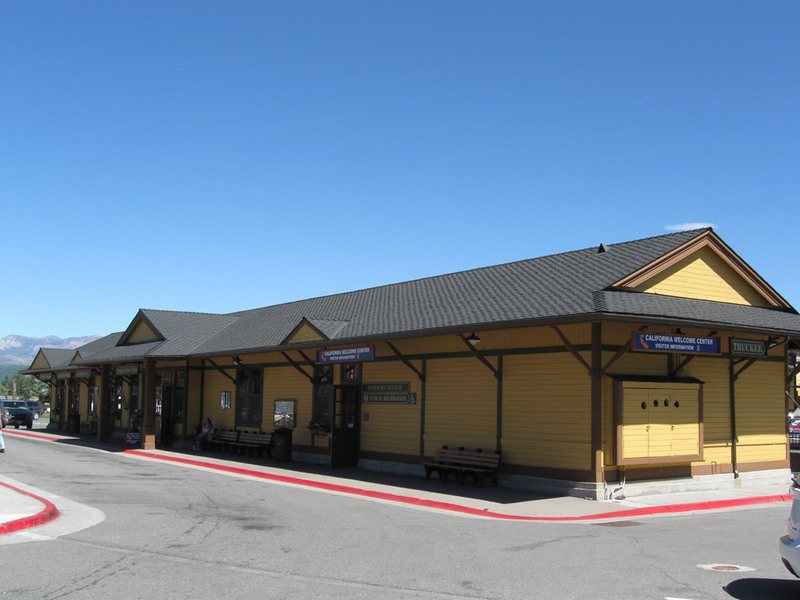 The Truckee train depot was restored and now serves as the official California Welcome Center. Photo taken 07/21/09. 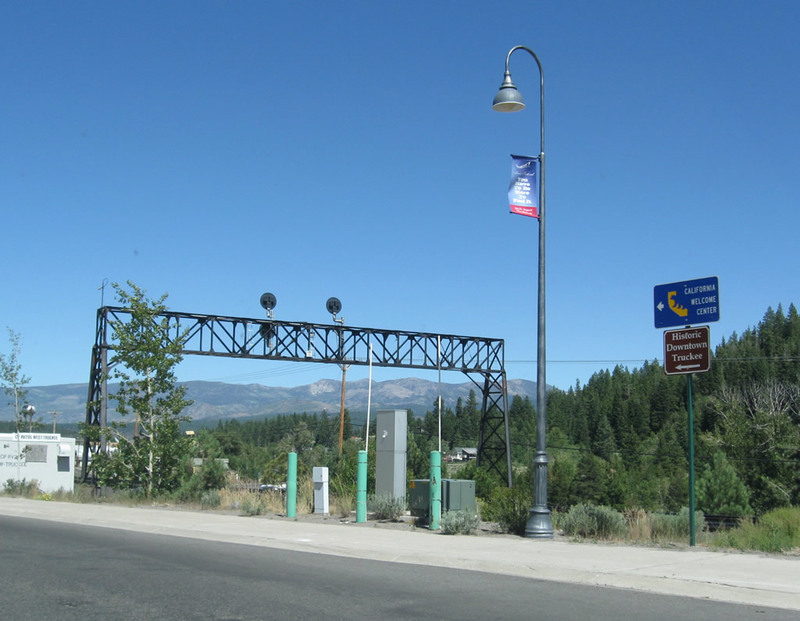 Labeled the "Jewel of the Eastern Sierra," this plaque is placed near the train depot in honor of the town of Truckee. Photo taken 07/21/09. 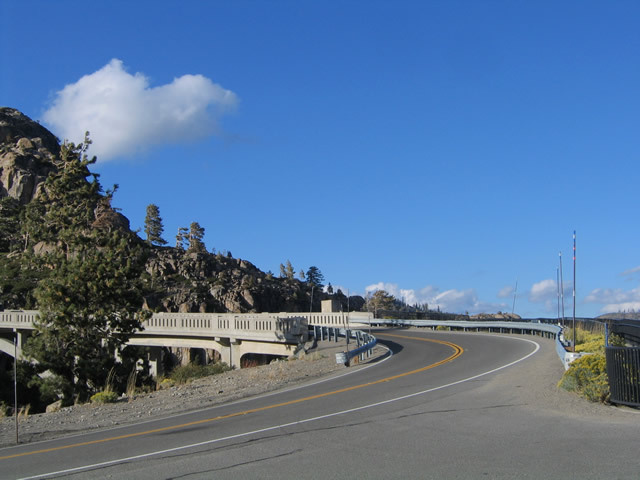 Eastbound Historic U.S. 40 (Donner Pass Road) approaches Bridge Street. 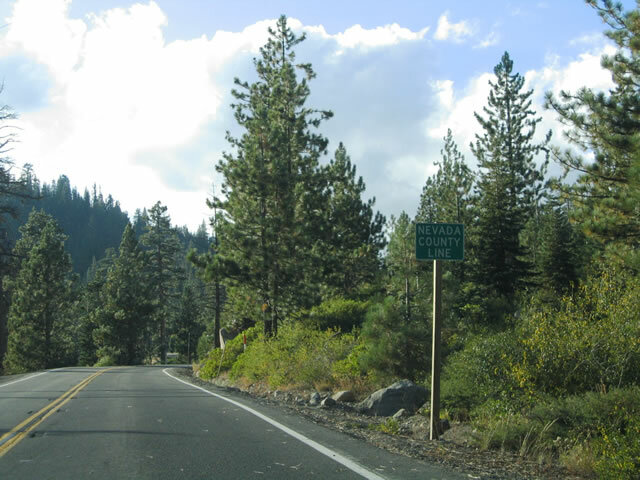 Turn right (south) to follow former California 267/Brockway Road to California 267, which travels southeast toward the Lake Tahoe destinations of Kings Beach and Incline Village, Nevada. Photo taken 07/21/09. 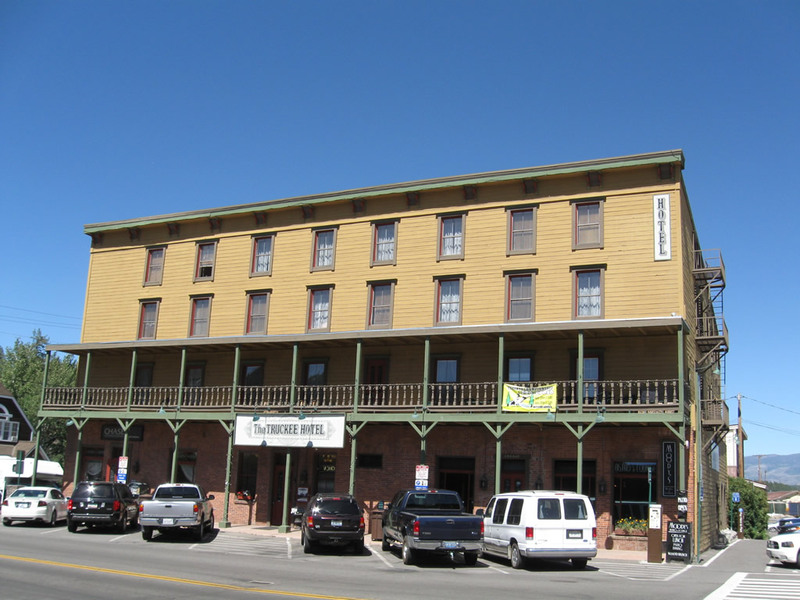 The Truckee Hotel is located at the northwestern quadrant of the intersection between Historic U.S. 40 (Donner Pass Road) and Bridge Street (former California 267/Brockway Road). Photo taken 07/21/09. 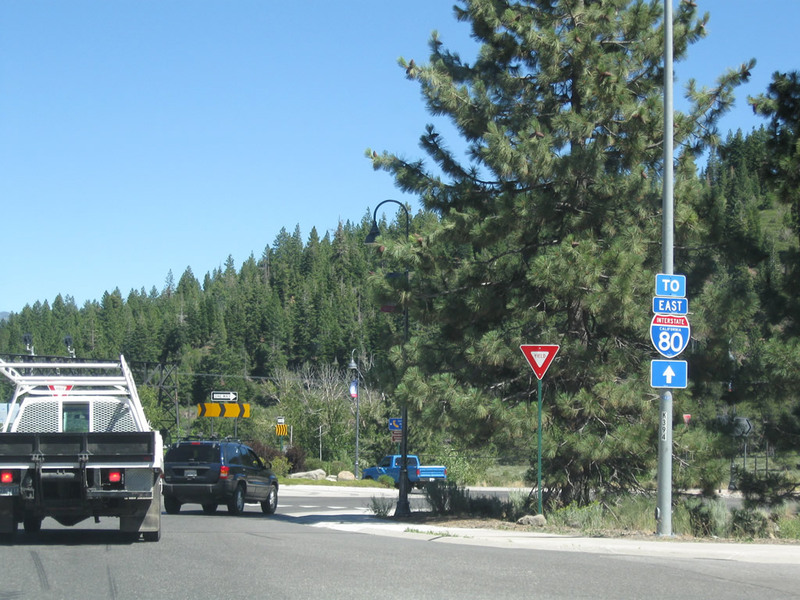 After the Bridge Street (former California 267) intersection, a trailblazer for Interstate 80 is posted along eastbound U.S. 40 as we leave downtown Truckee. Photo taken 07/21/09. 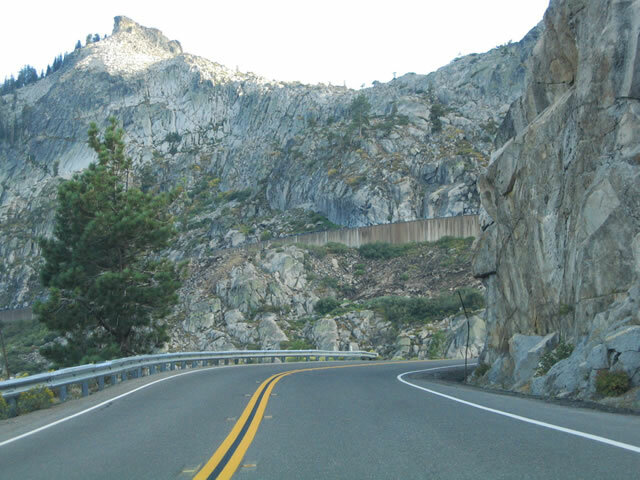 Historic U.S. 40 (Donner Pass Road) moves northeast, away from the Union Pacific Railroad and back toward Interstate 80. Photo taken 07/21/09. 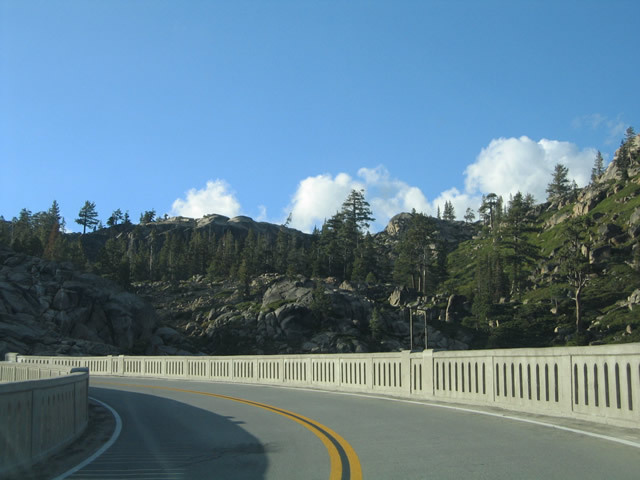 Guardrail along Donner Pass Road gets a special treatment to make it look more rustic and less noticeable against the scenery of the nearby trees and mountains. Photo taken 07/21/09. 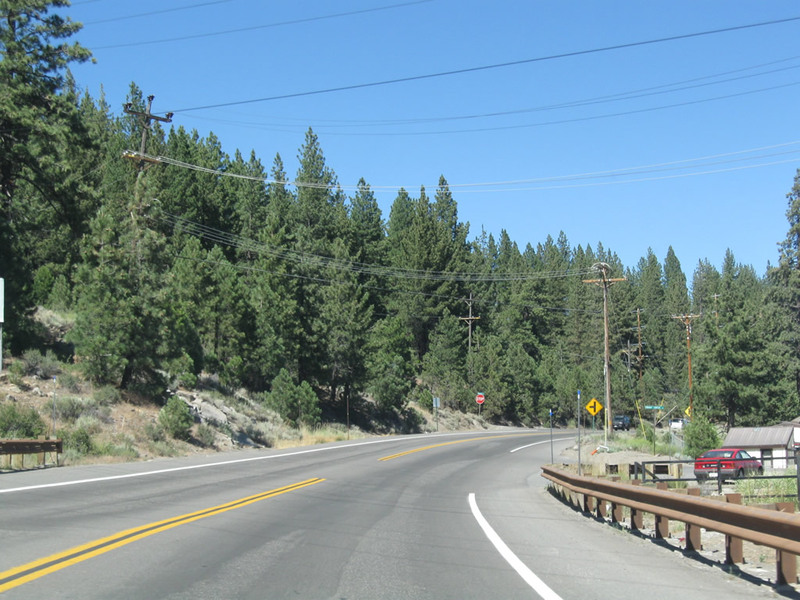 Eastbound Historic U.S. 40 (Donner Pass Road) approaches Glenshire Drive. 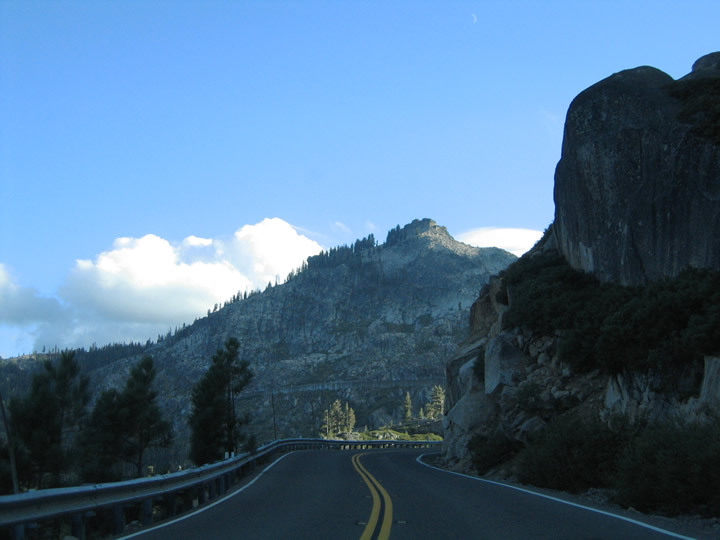 Old U.S. 40 proceeds east along Glenshire Drive and departs Donner Pass Road. Old California 89 and former Business Loop I-80 continue east to meet California 89&apos; modern alignment. Photo taken 07/21/09. 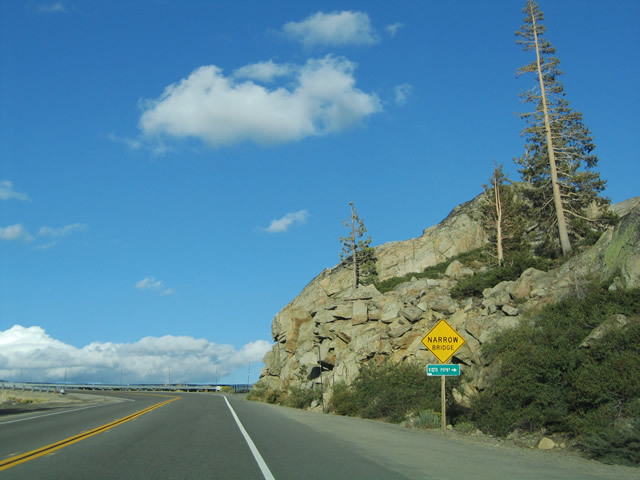 Donner Pass Road gains elevation prior to crossing over Interstate 80. Photo taken 07/21/09. Crossing over Interstate 80 again, there is only one ramp, and it leads to Interstate 80 west to Sacramento and San Francisco. 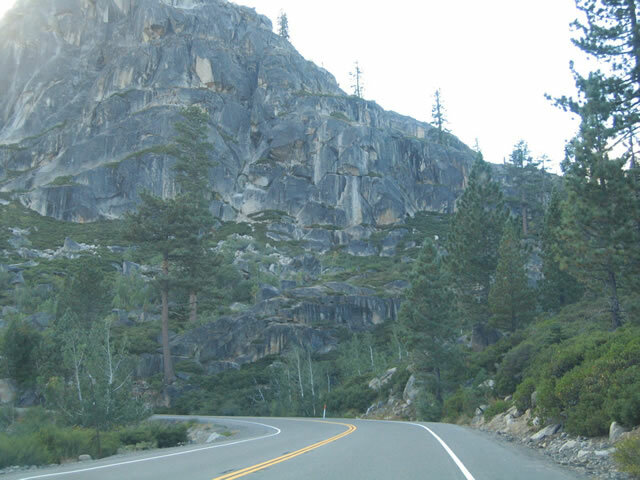 Continue straight along Donner Pass Road to Interstate 80 east, California 89 north, and California 267 south. Photo taken 07/21/09. 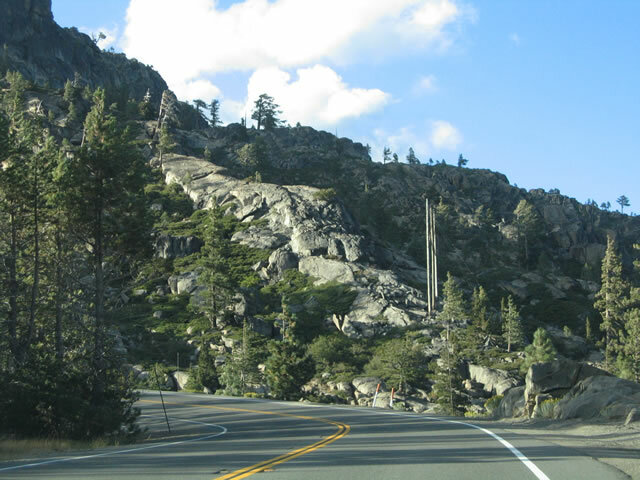 The next left from Donner Pass Road connects to Pioneer Trail Road. Photo taken 07/21/09. 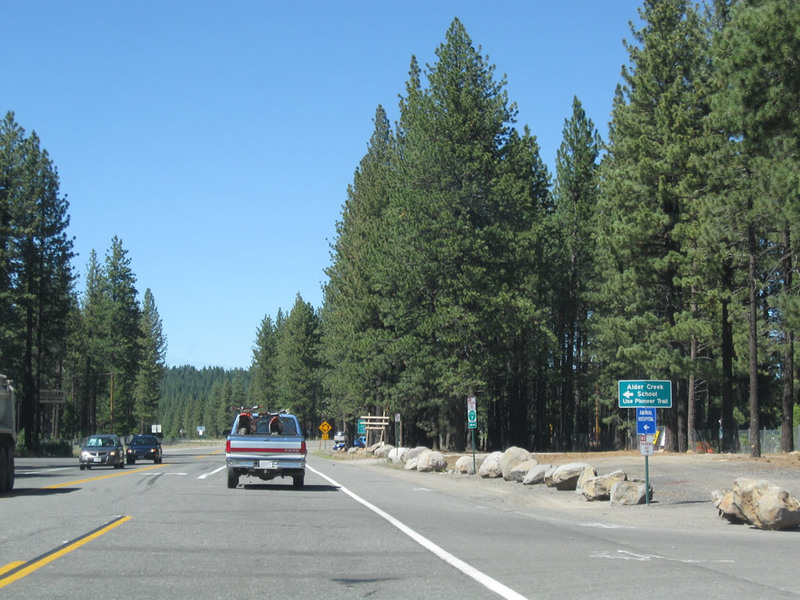 The intersection between Historic U.S. 40 (Donner Pass Road) and California 89 is a roundabout similar to the ones found west of downtown Truckee along Donner Pass Road. Photo taken 07/21/09. Stay left to follow California 89 north to Sierraville and points north. 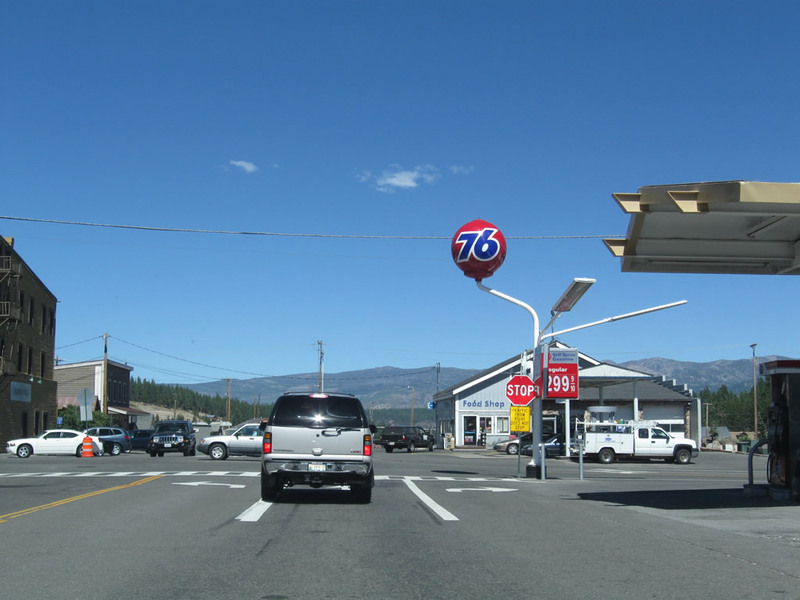 Stay right to Interstate 80 east and California 267 south to Lake Tahoe&apos; north shore resorts. Photo taken 07/21/09. 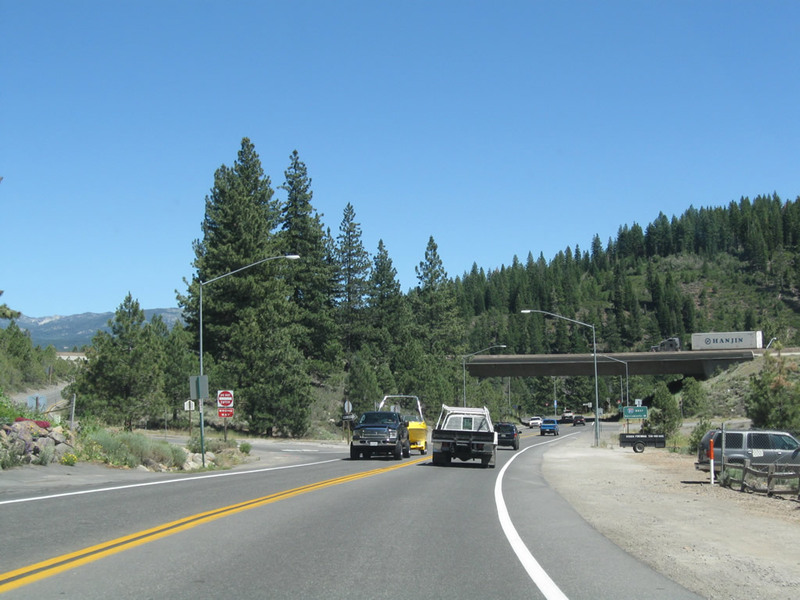 Donner Pass Road ends at the roundabout with California 89. Photo taken 07/21/09. 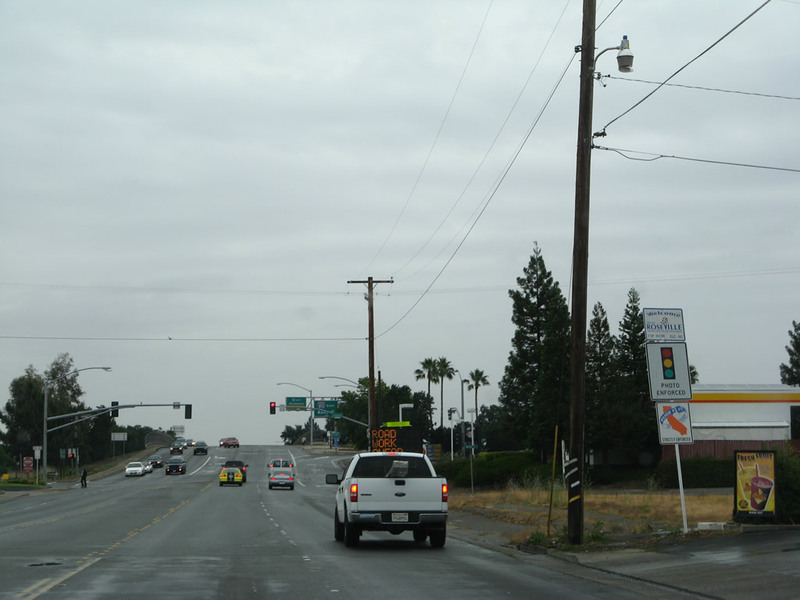 Turn south on California 89 to Interstate 80 east/west and California 267 south. Photo taken 07/21/09. 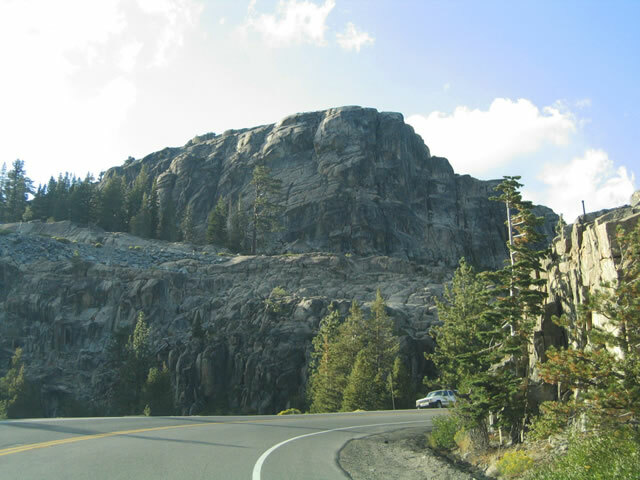 Historic U.S. 40 follows Donner Pass Road through the town of Truckee to Donner Lake. 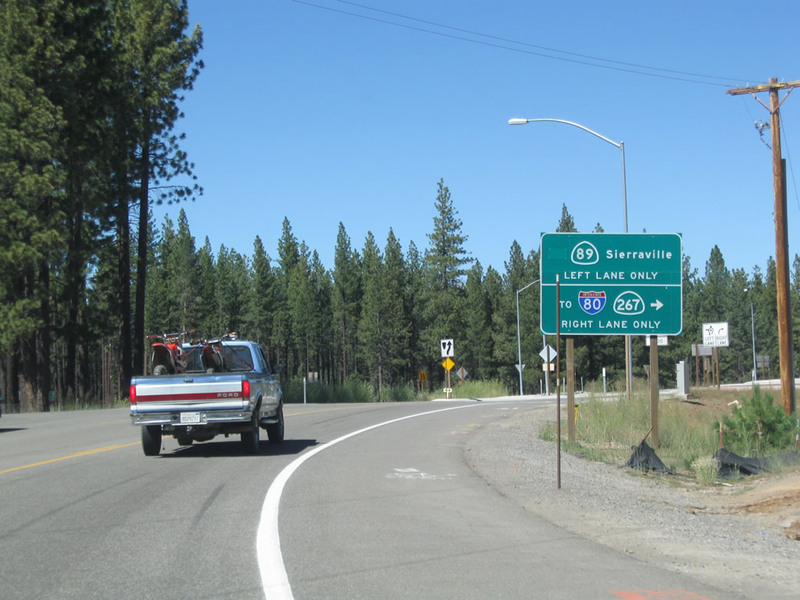 The two-lane roadway parallels Interstate 80 closely through Truckee itself before branching southward to Donner Lake State Park. 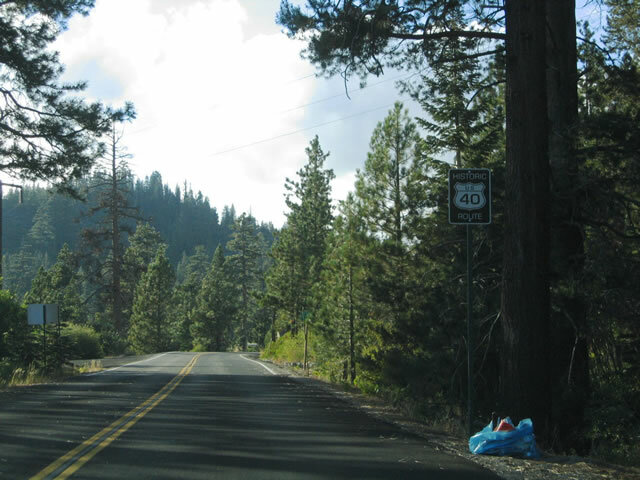 U.S. 40 continues west along the north shore of Donner Lake to the Nevada County line. The route is well signed through here. Photos taken 09/09/05. 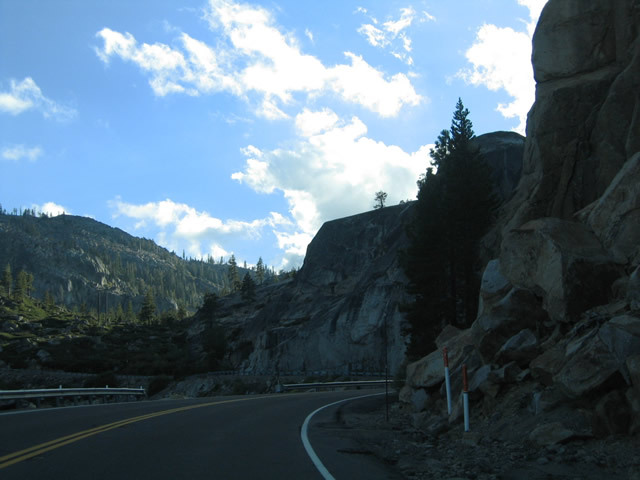 Once into Nevada County, Historic U.S. 40 (Donner Pass Road) begins a steep climb toward Donner Pass. 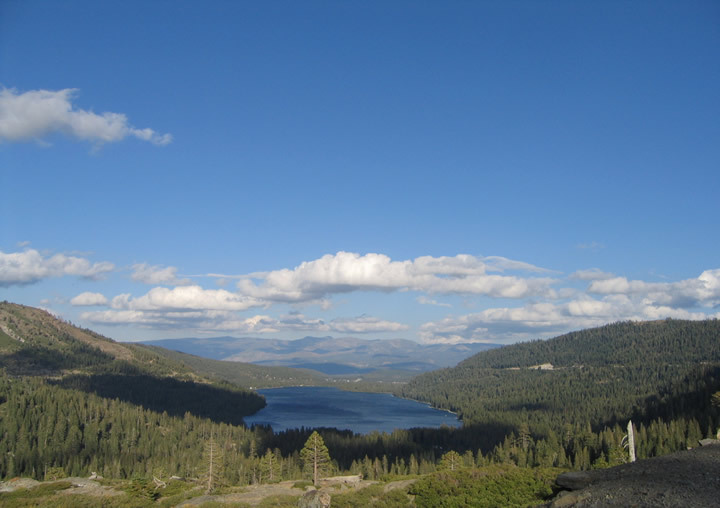 The drive involves an ascend from 6,300 feet at Donner Lake to 7,239 feet at Donner Summit. 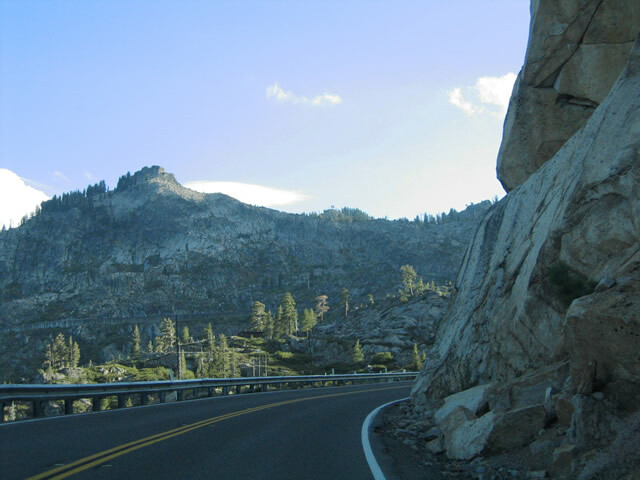 Many twists and turns lie along Donner Pass Road as the road hugs the mountainside. Photos taken 09/09/05. 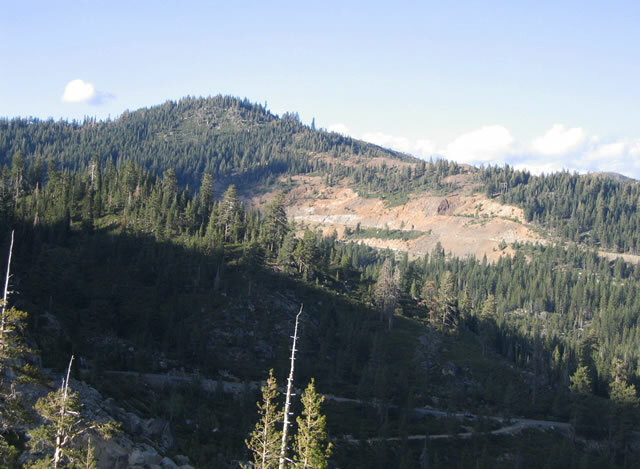 Continuing westward on the rise toward Donner Summit. 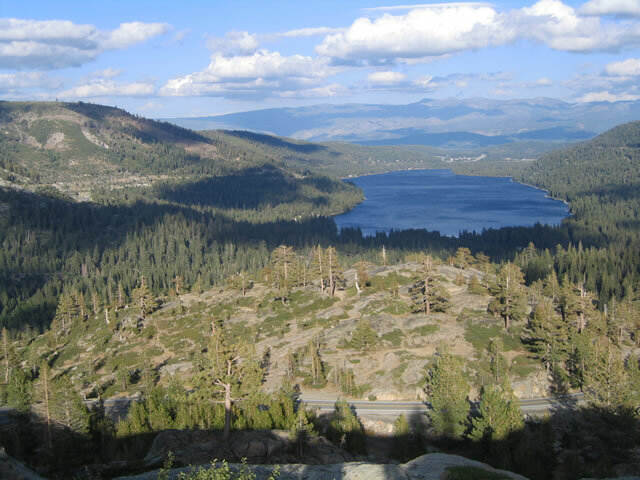 A pull-off midway towards the summit provides a spectacular view of Donner Lake and the Sierra Nevada north of Lake Tahoe. Photos taken 09/09/05. Looking back toward the northeast at the Interstate 80 cut along a nearby hillside. 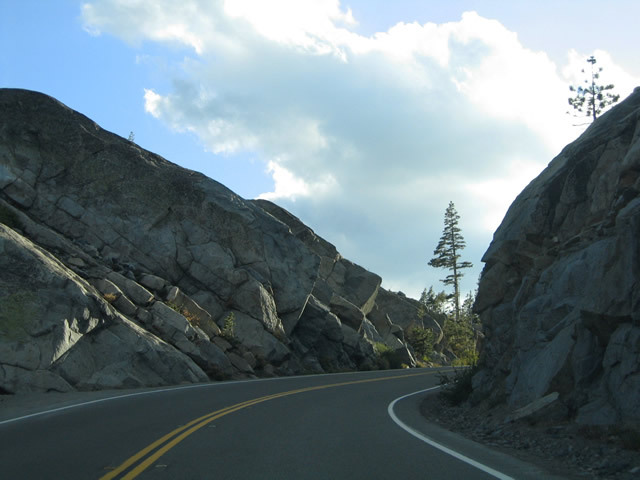 The climb along Interstate 80 is much smoother between Donner Lake and Donner Pass. However driving the freeway is still not to be taken lightly as the grade is steep enough to cause runaway trucks and dangerous conditions during snow storms. Photo taken 09/09/05. Almost at Donner Summit on Historic U.S. 40 (Donner Pass Road) westbound. The parallel Union Pacific Railroad lines a nearby mountain to the south. 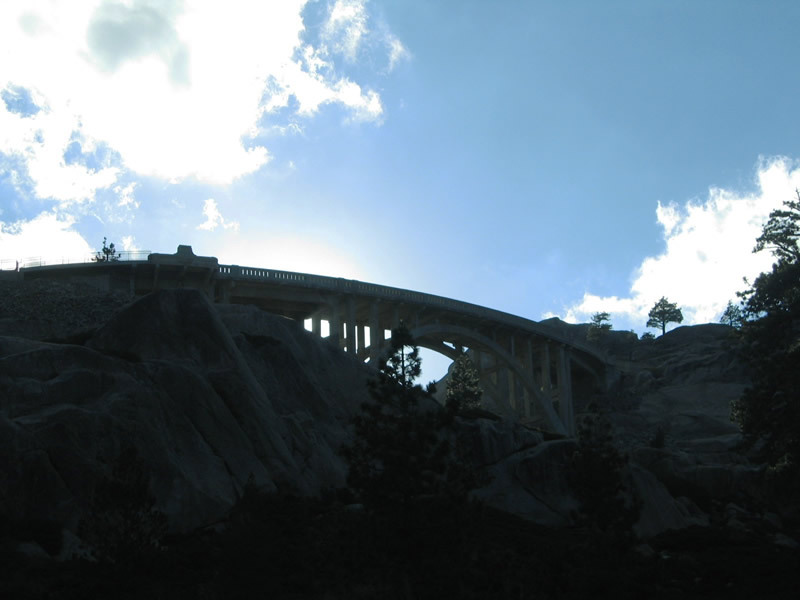 At the very top is a concrete-arch bridge spanning a narrow valley. Photo taken 09/09/05. 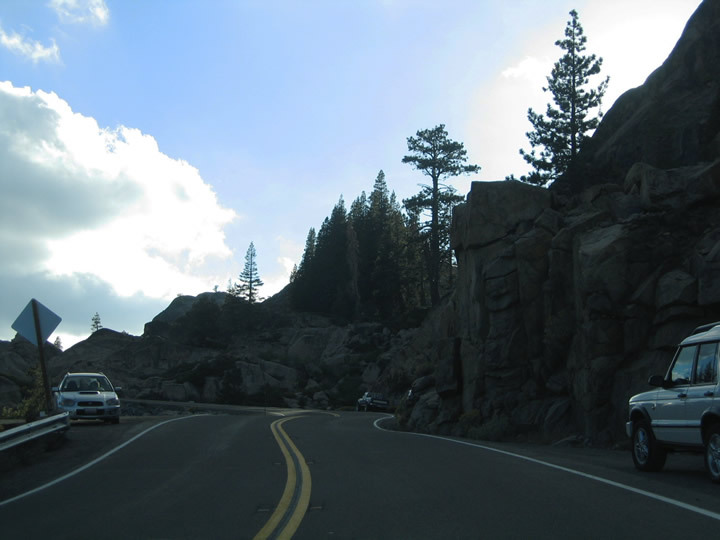 Historic U.S. 40 westbound finally reaches Donner Summit. A vista point provides travelers with a chance to soak in the high altitude landscape ahead of the aforementioned concrete arch bridge. Photo taken 09/09/05. 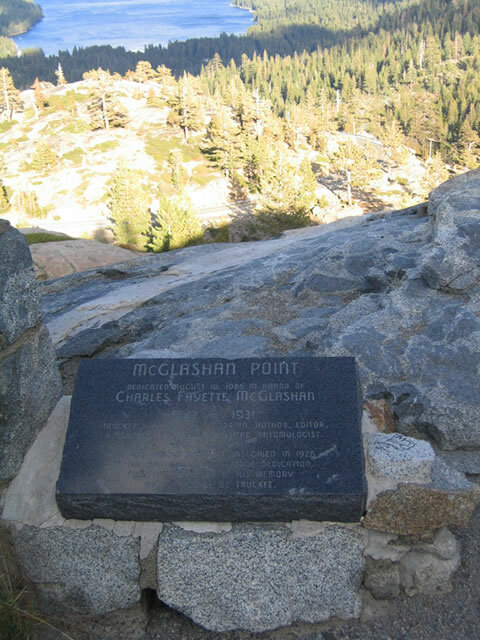 Known as McGlashan Point, the Donner Pass Road view area provides fantastic views of the Donner Lake and Truckee area in the valley below. A walk across the two-lane roadway reveals the full scope of the adjacent concrete bridge. A date stamp along the span indicates a completion date of 1925. Photos taken 09/09/05. 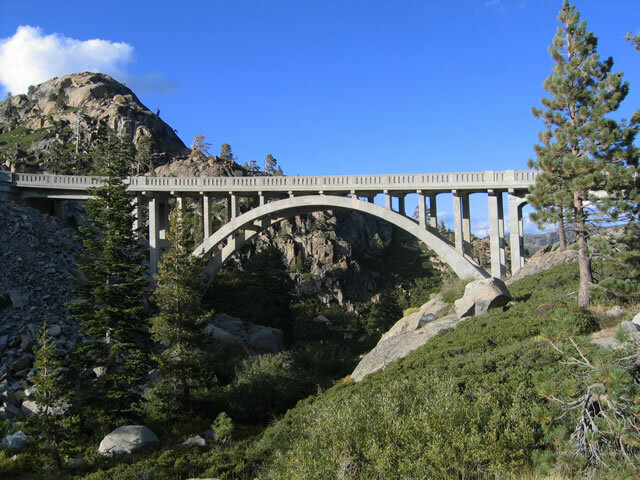 Two views of the McGlashan Point concrete arch bridge from Donner Pass Road itself. Note the snow sticks placed on the Historic U.S. 40 approach to the span. Photos taken 09/09/05. Continuing the drive westbound to Norden and Soda Springs west of Donner Pass. The villages provide amenities for skiers and visitors alike. Historic U.S. 40 meets Interstate 80 at Exit 178 four miles west of McGlashan Point. Photos taken 09/09/05. 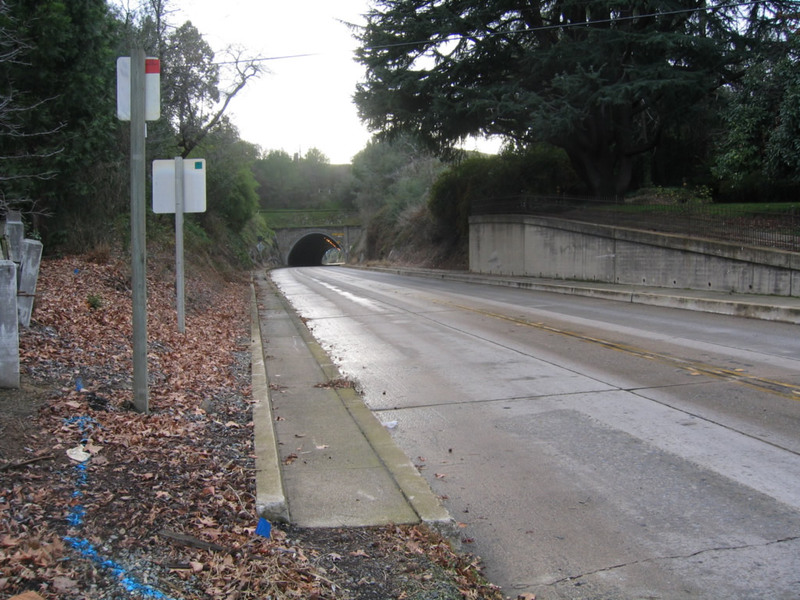 After splitting from California 193, Old U.S. 40 follows Taylor Road through this tunnel near Newcastle. Photo taken 12/27/04. The two-lane tunnel carries Taylor Road (old U.S. 40) past Newcastle and through to Penryn. Photo taken 12/27/04. "Two roundabouts down, more to come." Sierra Sun, December 23, 2005. Page Updated December 31, 2011.